I went to bed around 1am on the ferry, and wasn’t looking forward to getting up at 5.45am to have breakfast and get ready, but then in a Phileas Fogg moment I realised I had the extra hour from going from France to the UK. Today’s navigation was a bit of an issue. 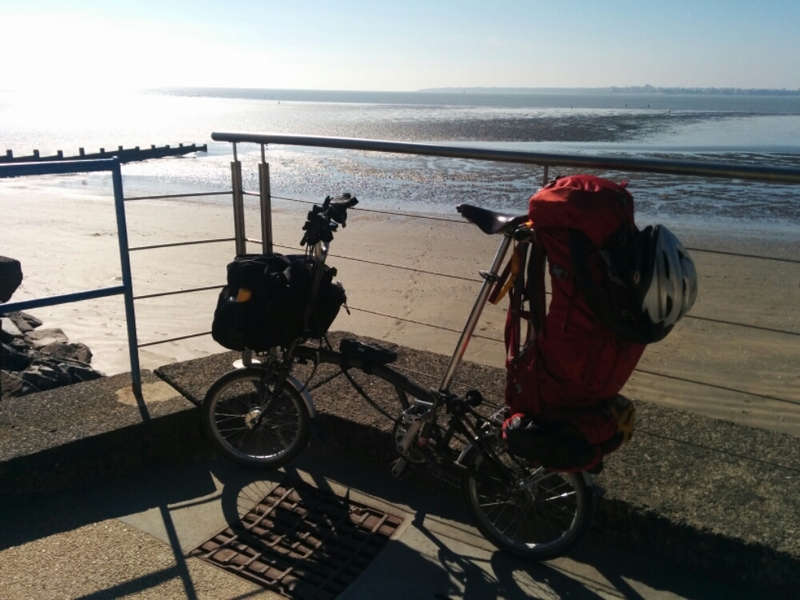 I had found a route online that someone had posted of a nice way to get from Portsmouth to London by bike, but I had no way of getting it onto my Garmin satnav, so it remained on my phone. 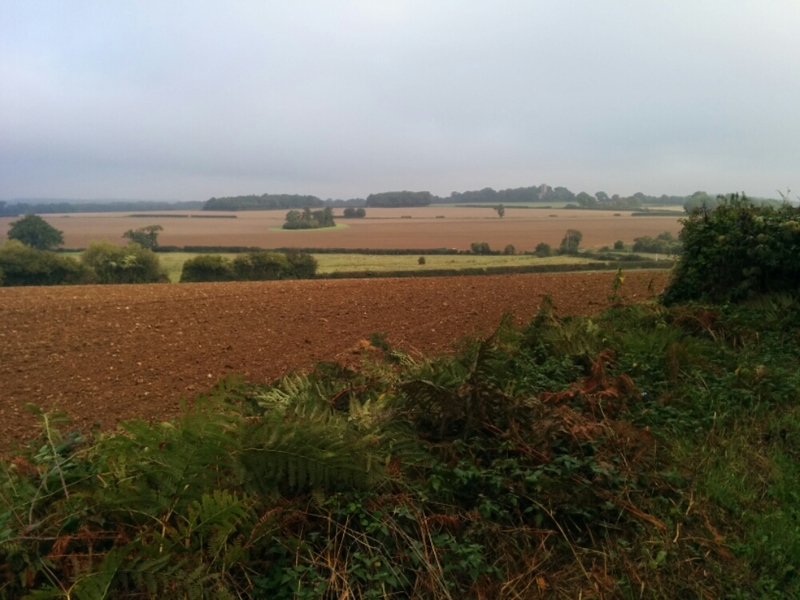 However once I’d got into the countryside, I couldn’t use my phone as I had no reception, so I stumbled my way towards London just generally heading East and North. 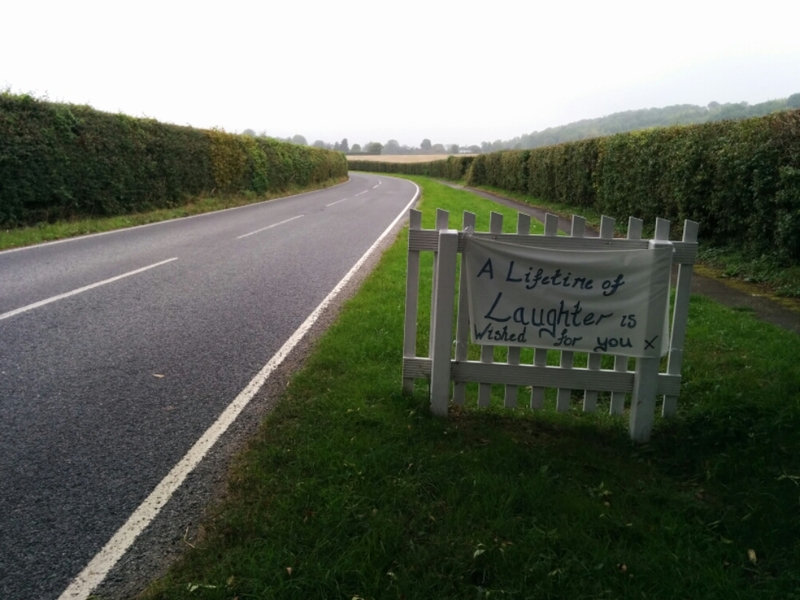 The UK countryside between Portsmouth and London is very picturesque, and I saw many nice villages on the way. “A lifetime of laughter is wished for you” – a bit weird.. laughing all the time like a mad man.. I took a few breaks to have sandwiches, but millions of breaks trying to figure out which direction I should be heading. And lots of hills in West Sussex and Surrey too. Nothing major, and a few other cyclists out enjoying the morning. 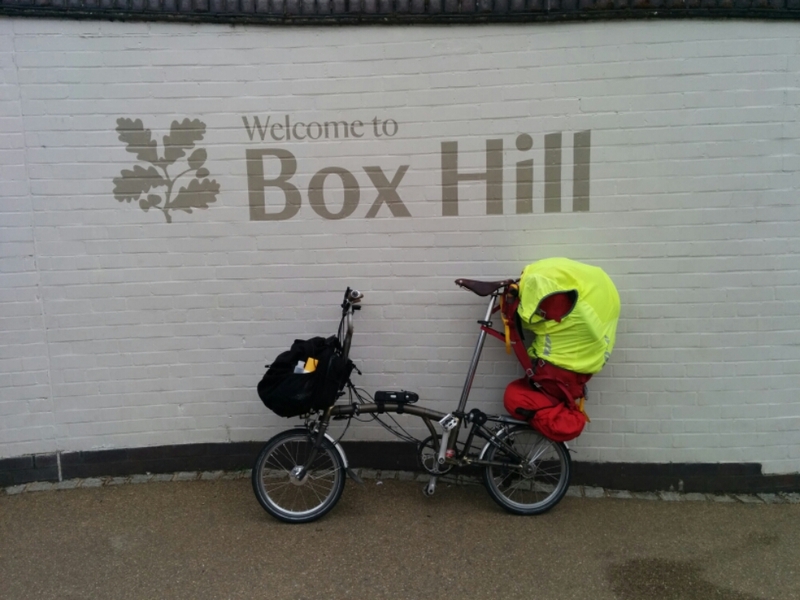 My geography knowledge of Surrey and South London is completely lacking, and by pure chance I found myself going past the foot of Box Hill which is much used by cyclists. 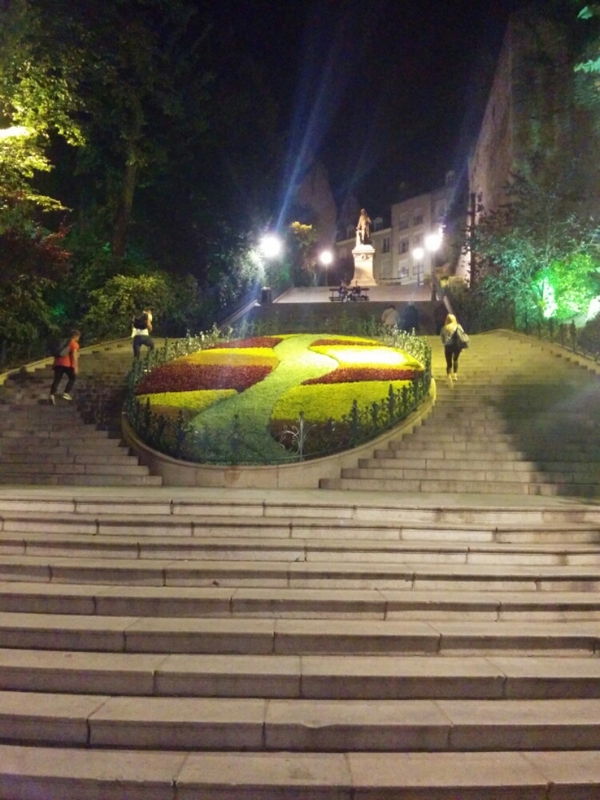 I’d never been here before so thought I’d have a go at going up it. It’s not actually steep at any point along it’s route, it’s just persistent, so I found it easily manageable after all the hills I’ve been doing for the past 6 weeks. I might try it again soon without all the touring gear. The toilets at the top were out of action with a note saying ‘sorry for the inconvenience’ – not sure if this was an intended pun. 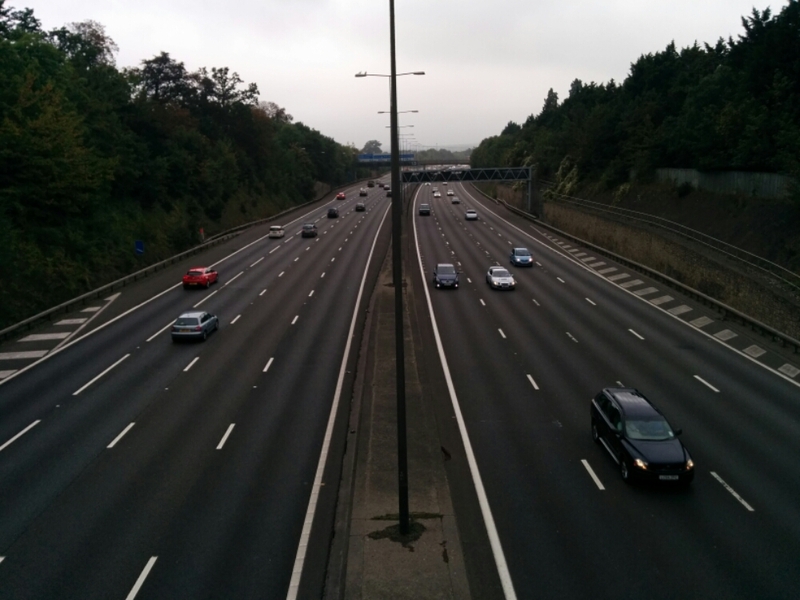 It was nice to pass over the M25 – now officially back in London. Traffic looking good on the M25! After bumbling my way across South London, I eventually found myself on Cycle Superhighway 7 – this is a painted blue lane which meant I didn’t have to worry about navigation any more as it would guide me into central London. I’m not sure what the ‘super’ refers to – I think it is the number of obstacles in the bike lane such as parked cars, people and broken glass. 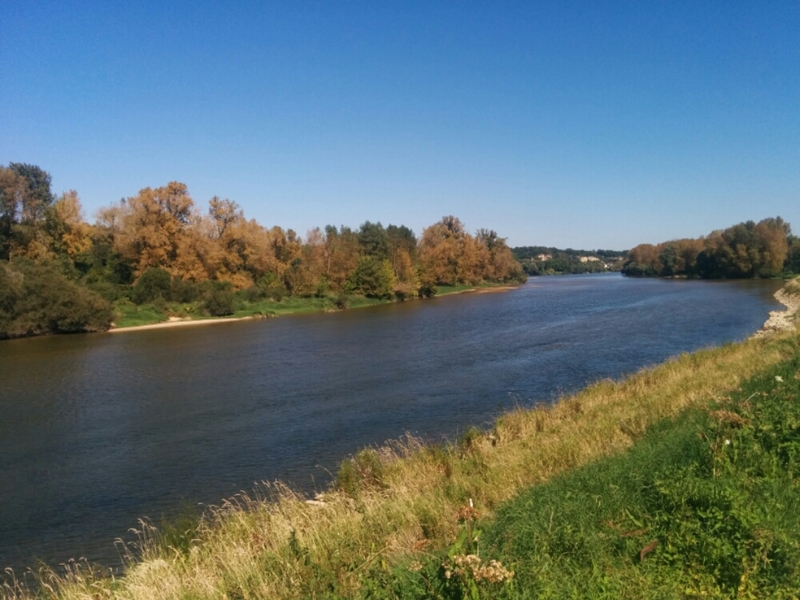 Once I got close to the river I made my way across it, glad to be in an area I was more familiar with. 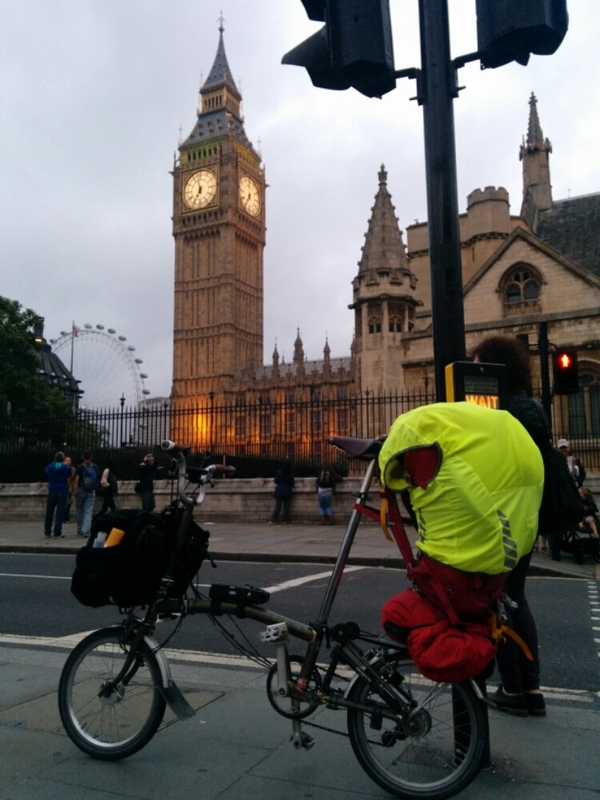 I headed East along Millbank to Westminster. Then North up through Camden towards Enfield. Traffic was awful across the whole of London as it was Saturday evening. 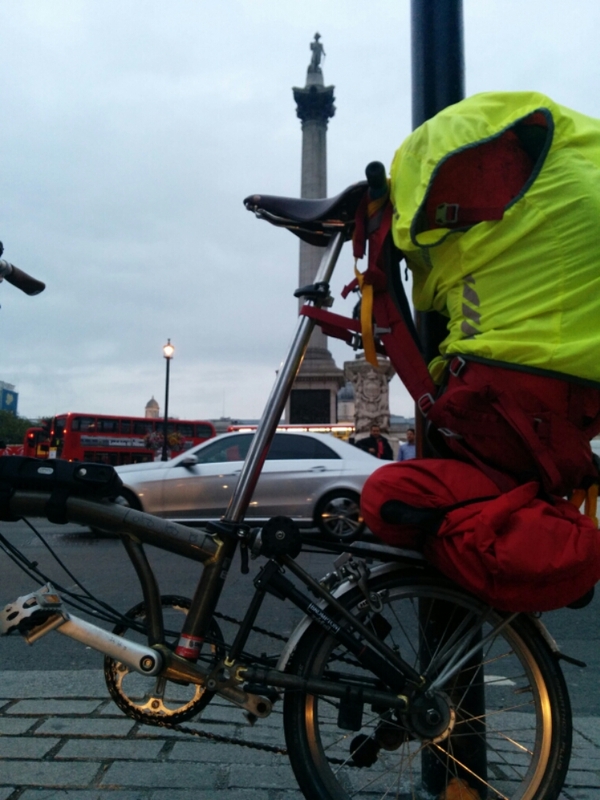 It was only when I reacheded Palmers Green that the traffic petered out and I could cycle without interruption. I had a nice welcome home, with champagne celebration and dinner with tasty veg from the allotment. Cycling adventure over! What next?.. 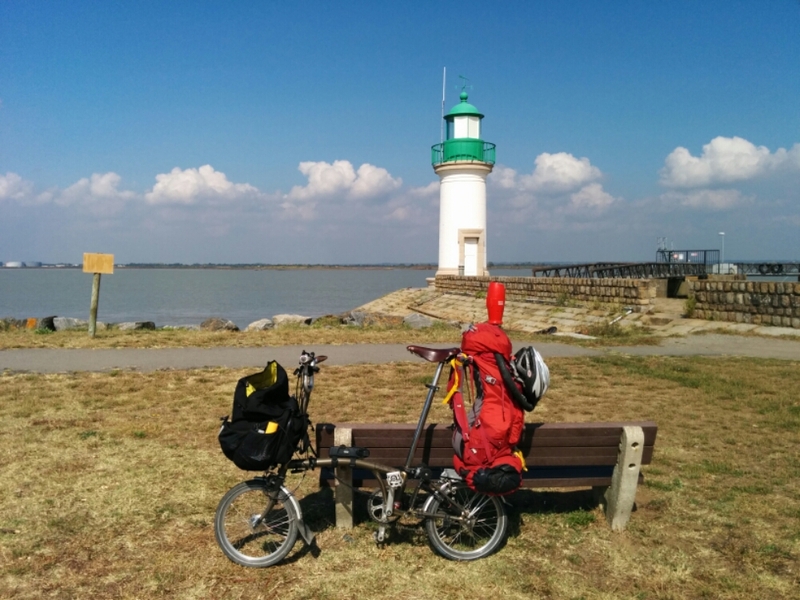 Portsmouth to London, 160 km. Total distance cycled = 4,152 km. One of the old barns at the farmhouse I am staying out now houses a heated swimming pool, so I was up early to take advantage of that. Then breakfast was at a large table with the other guests – an American couple and three French couples. After the Americans had left I managed to comprehend a large part of the French conversation and also contributed a little (in French!). No doubt I’ll still continue to be saying ‘pardon’ after bumping into people when I get back to the UK. 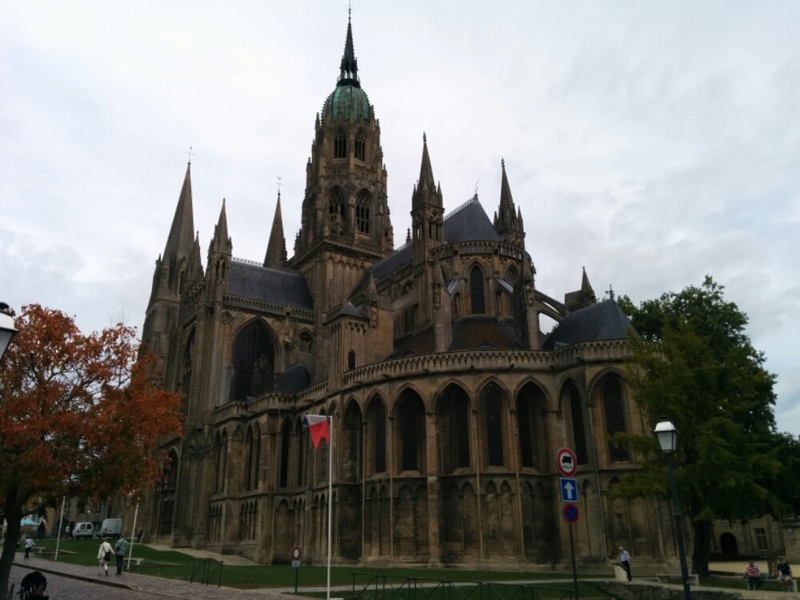 After checking out I headed to Bayeux. 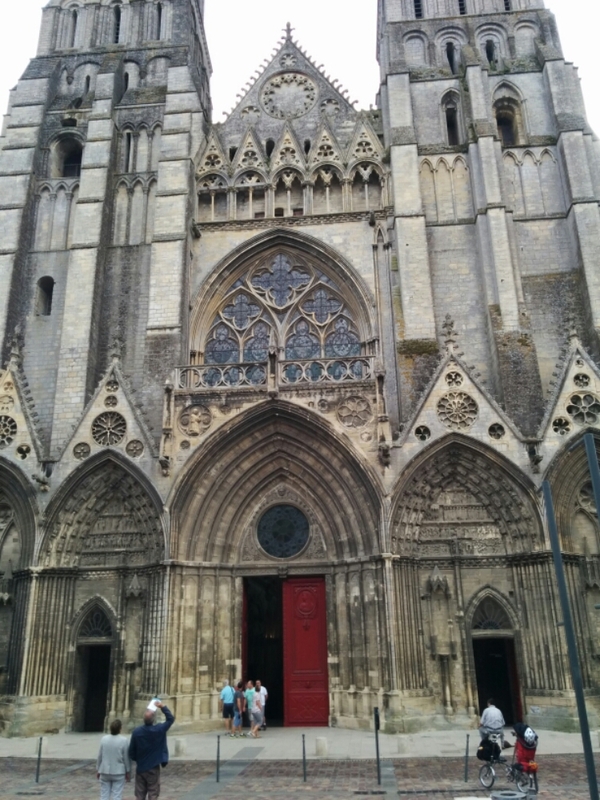 I thought the cathedral was impressive. The organ sounded really good. I have a video clip it didn’t record well on my phone: https://www.youtube.com/watch?v=o8naTQmgfzQ (A decent digital sound recorder was on my list of things to take that didn’t make the final cut). I then popped to see the bayeux tapestry. No photos allowed, sorry! I think you have seen the pics before though.. 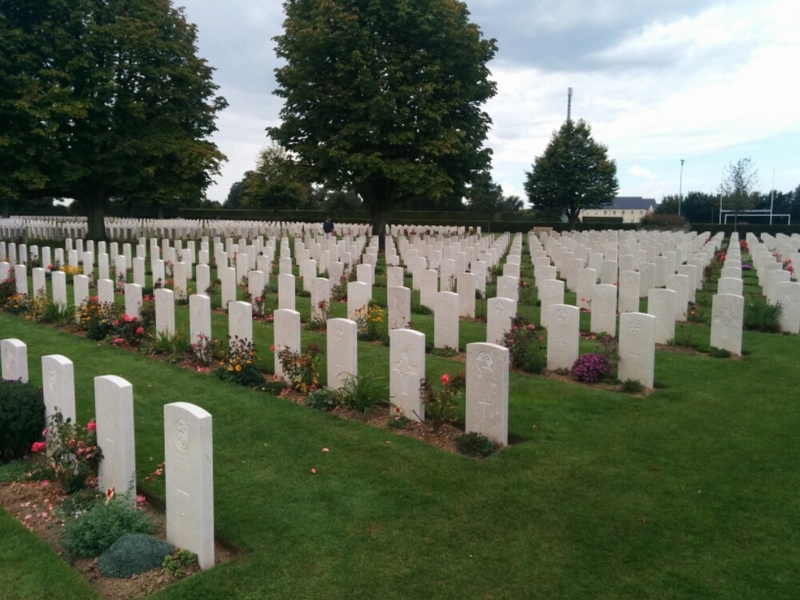 Afterwards I went to the British war cemetery. 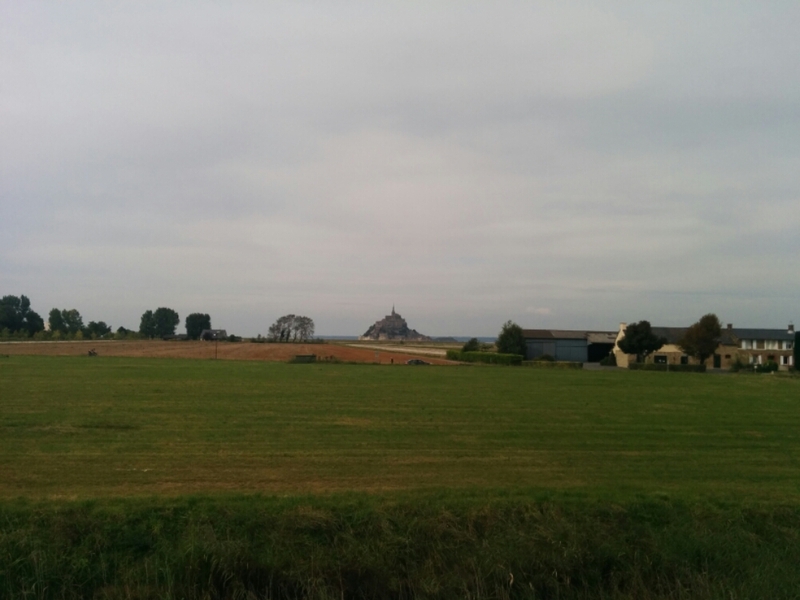 I then cycled up to the coast and cycled along the area of the D-Day landings and invasion. 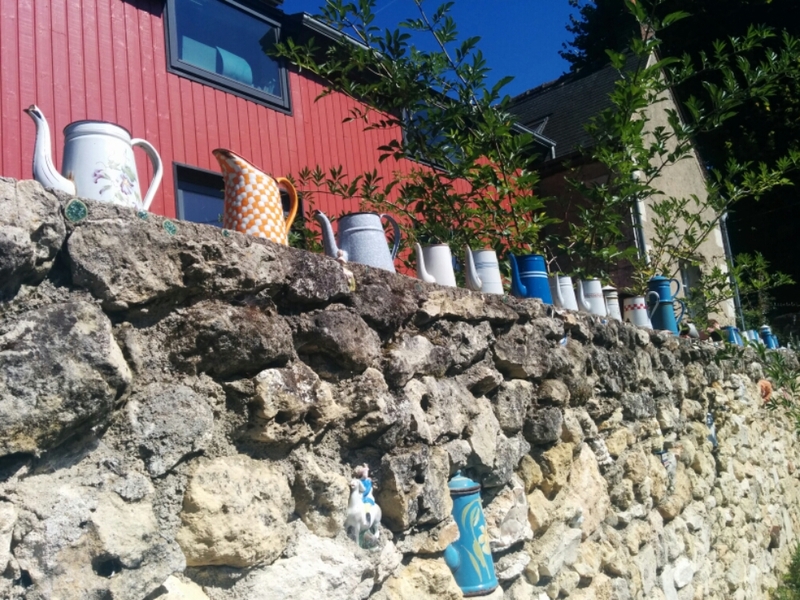 History becomes realistically imaginable when you are in situ. Seeing the geography of the region and the distances involved from the beaches to the defences brings everything to life. 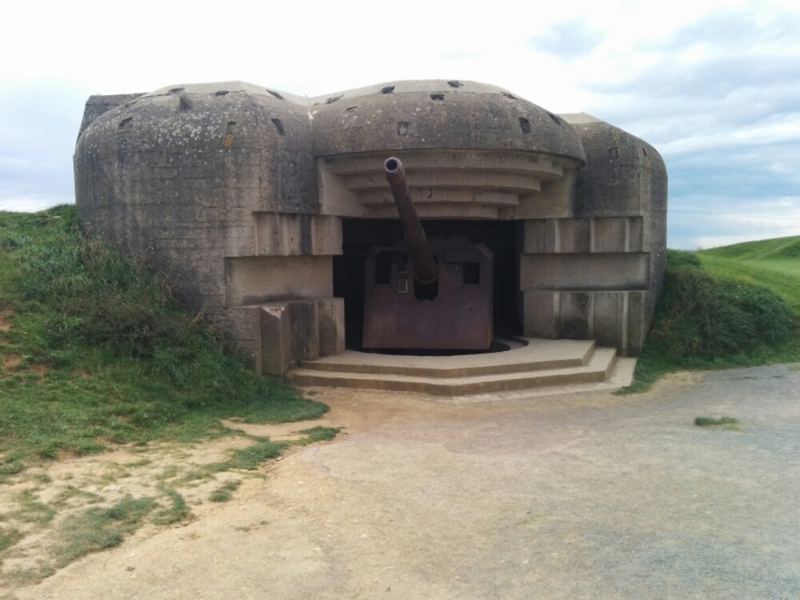 I spent the afternoon cycling along the coast, visiting the various invasion sights. The following house came as a bit of a surprise though. It had a poem by Rabalais on the front of the house. There were lots of dragons on the side. Steer clear I reckon! I reached the port about 3 hours before my ferry was due. 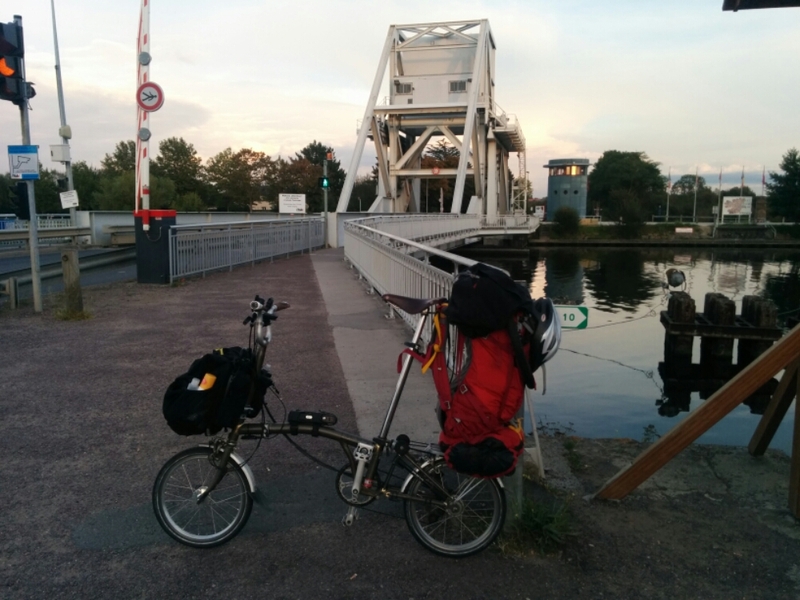 A man I had met at the British military cemetery had recommended I visit Pegasus Bridge, a key part of the D-day invasion so I cycled along the canal to Caen and back. The canal is a nice cycle path. 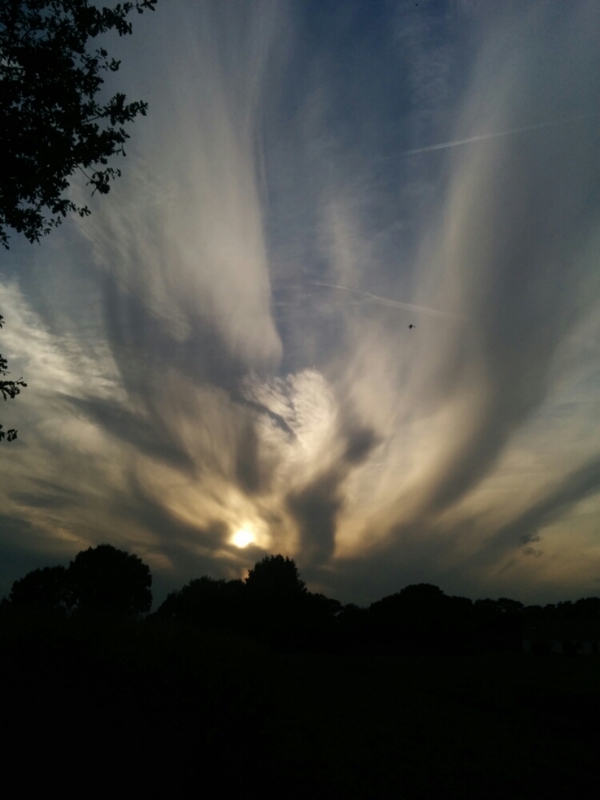 And it was a pleasant sunset. 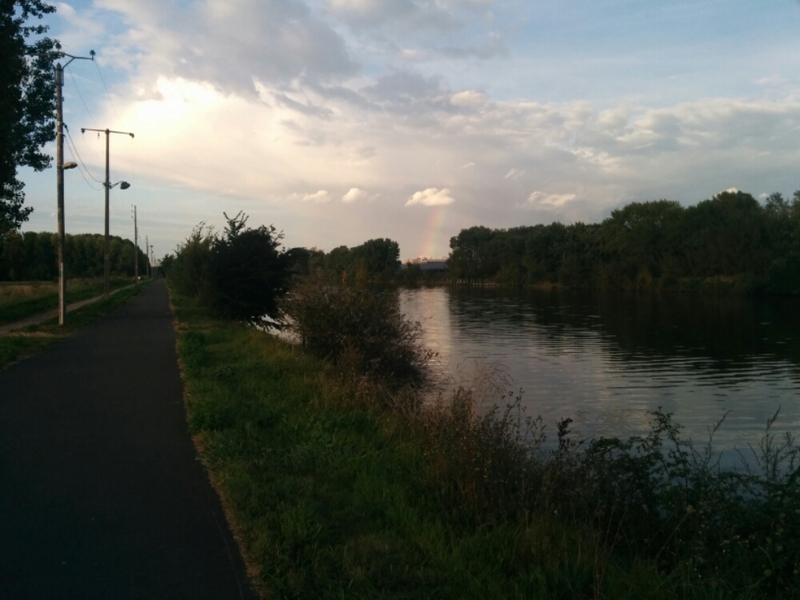 There was even a chunk of rainbow. A good omen? 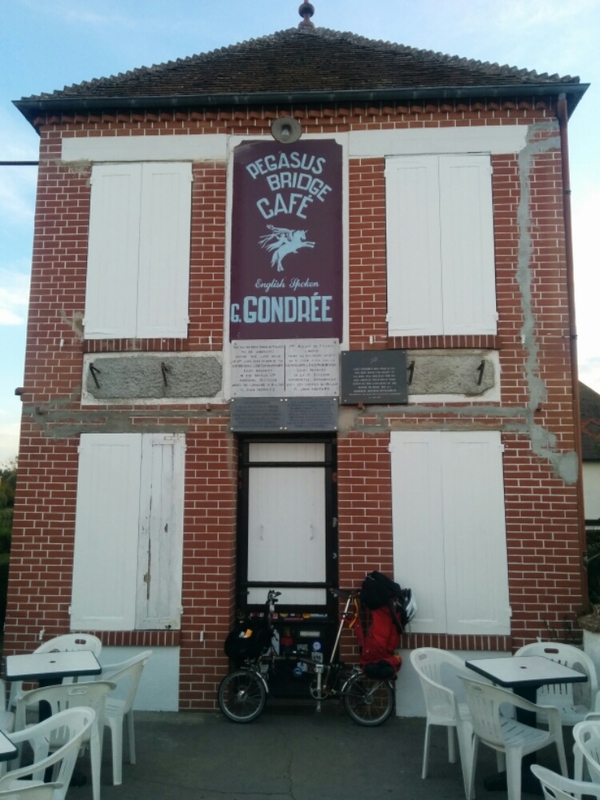 And here’s the café by the bridge which was possibly the first French house liberated on D-day. 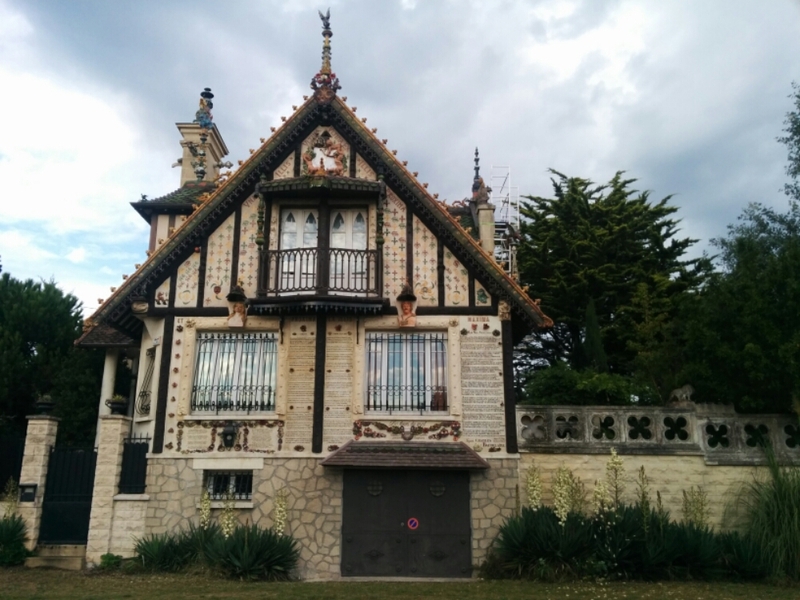 The owner of the café now was living as a small boy in the house on D-day. 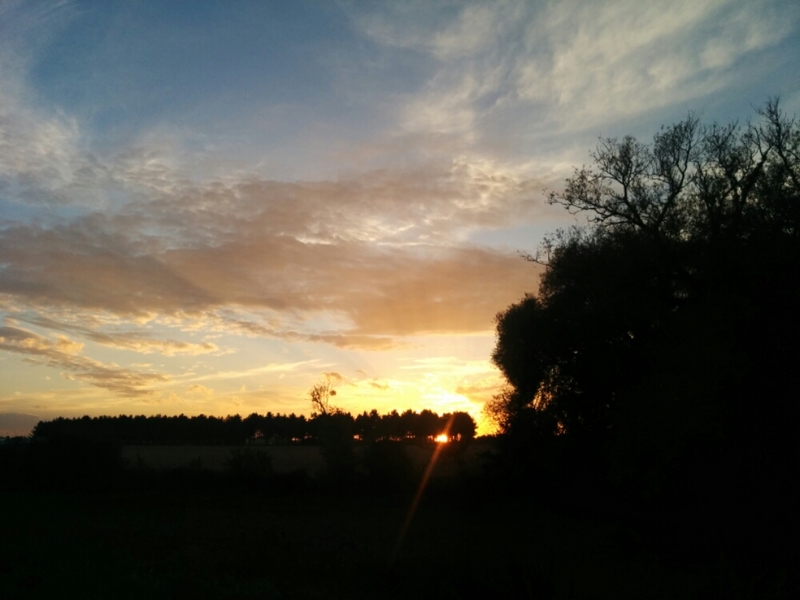 Then a nice sunset to conclude the holiday! And as I neared the ferry port, I passed this auspiciously named boat. I boarded the ferry as a foot passenger to avoid having to queue up with the cars. 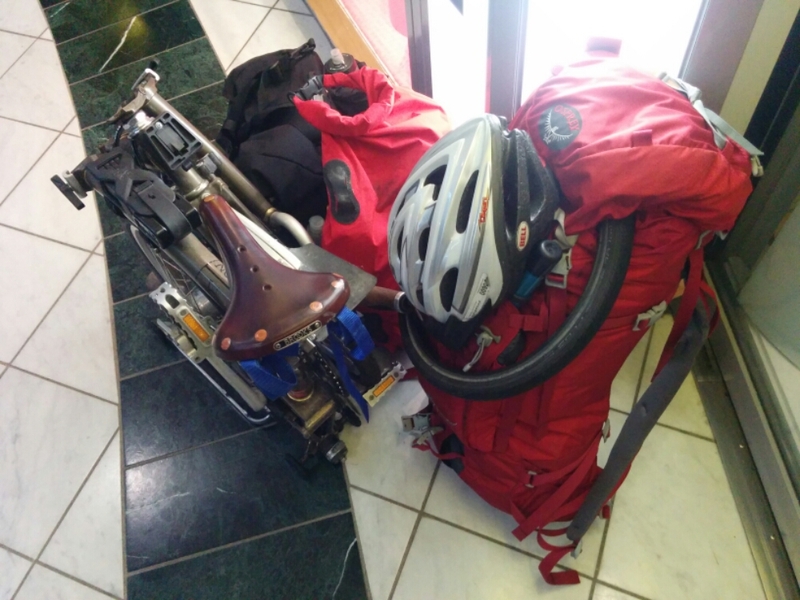 I’d booked a berth so was able to drop off my bike and bags and then head to the bar for a quick drink. À tout à l’heure France! 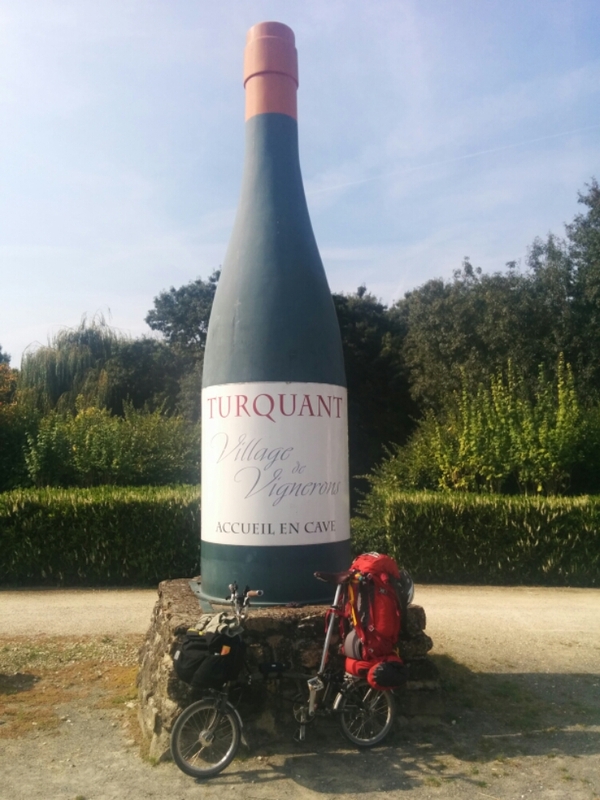 Mosles to Ouisteham, 95 km. Total so far = 3,992 km. It rained a lot overnight but had stopped by morning so it was dry when I set off, but after an hour or so it started again and then rained for the majority of the day. 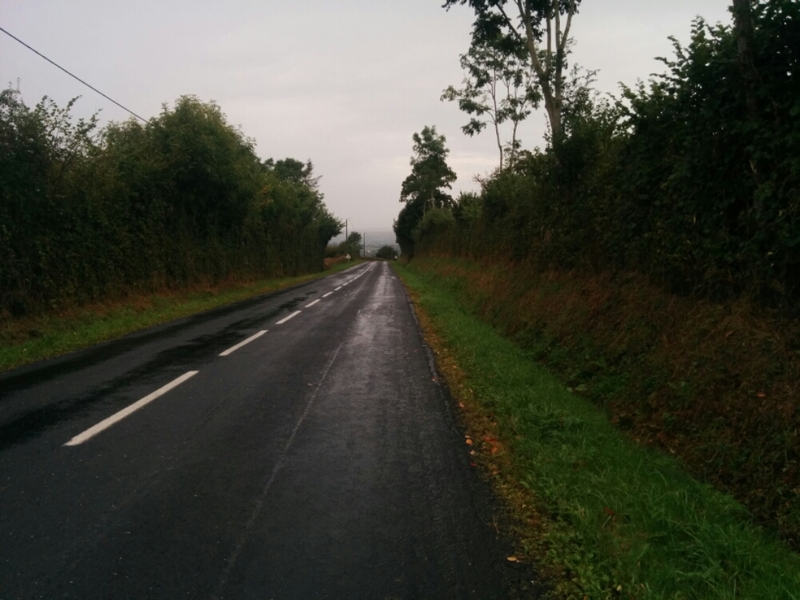 The day was spent either cycling up hills or down them – Normandy, from what I’ve seen, does not have any flat bits. 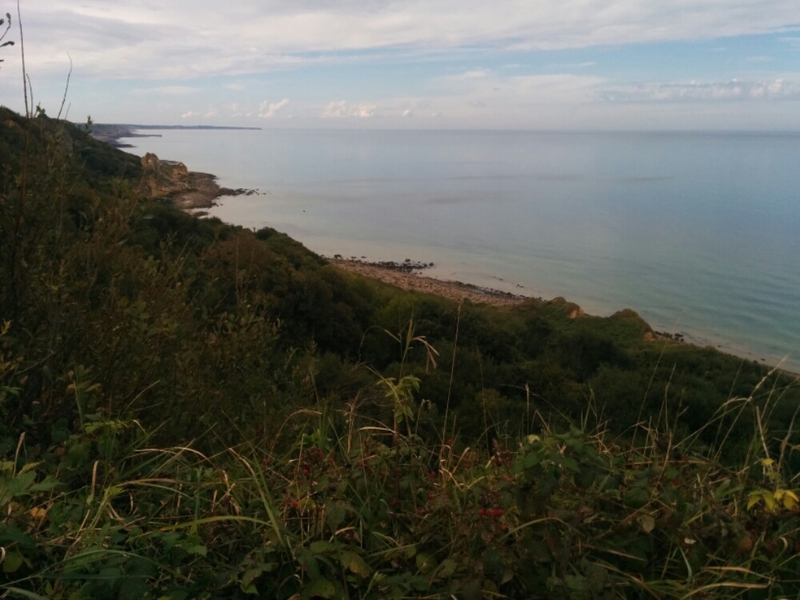 I travelled along Liberty Road for a couple of hours, and my destination for the day was just a few km inland of Omaha Beach. 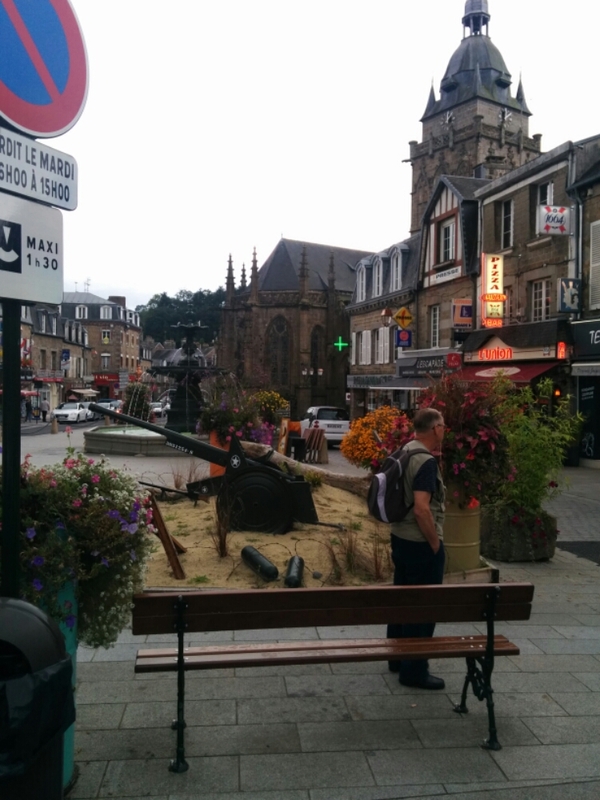 The thousands that lost their lives and impact of the Normandy landings and invasion are remembered well in Normandy. There were plenty of shops open and I stopped off a couple of times for bites to eat along the way. My no. 1 gripe with cycling in the rain is the bike gets super mucky. Another downhill. Just as much fun with wet brakes. 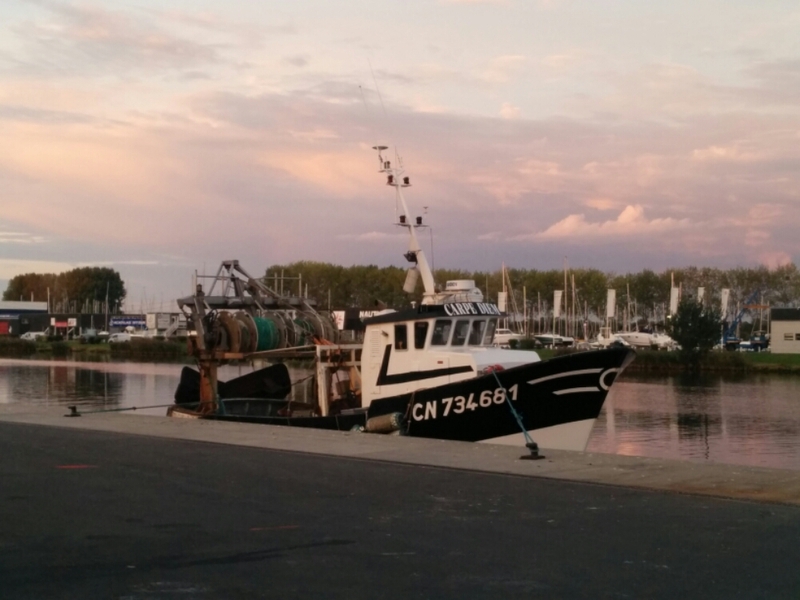 After checking in I cycled to the local port town of Port-en-Bessin-Huppain. It’s a small fishing town and there were some boats coming in and out whilst I was there. I had some dinner there, then headed the 10 km back inland to the farmhouse along the very dark country roads. I’m glad I don’t believe in ghosts as there would be many around here. 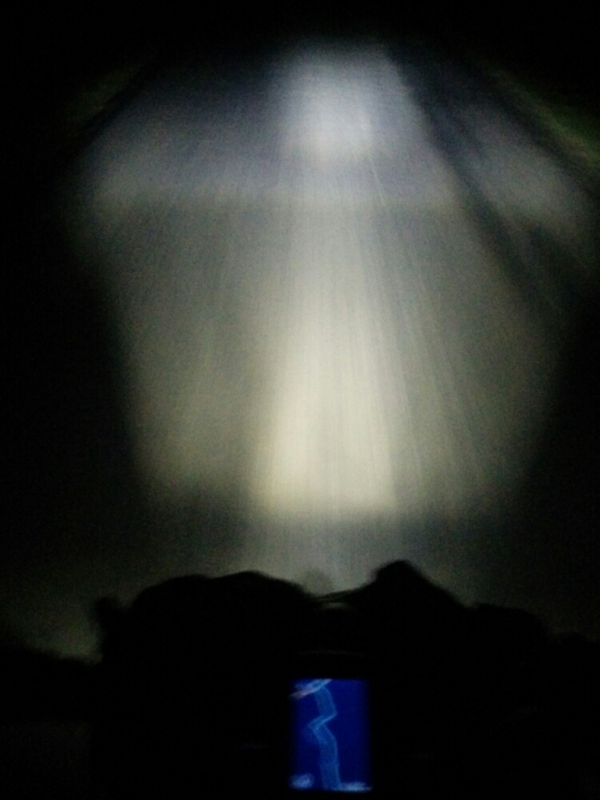 And I’m really happy to have decent bike lighting and my satnav to show me the way back. 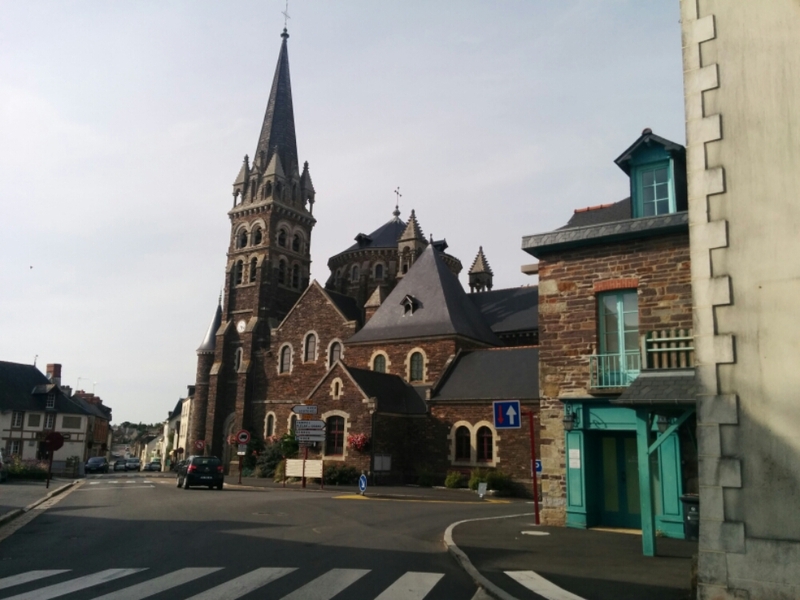 Avranches to Mosles, 116 km. Total so far = 3,897 km. 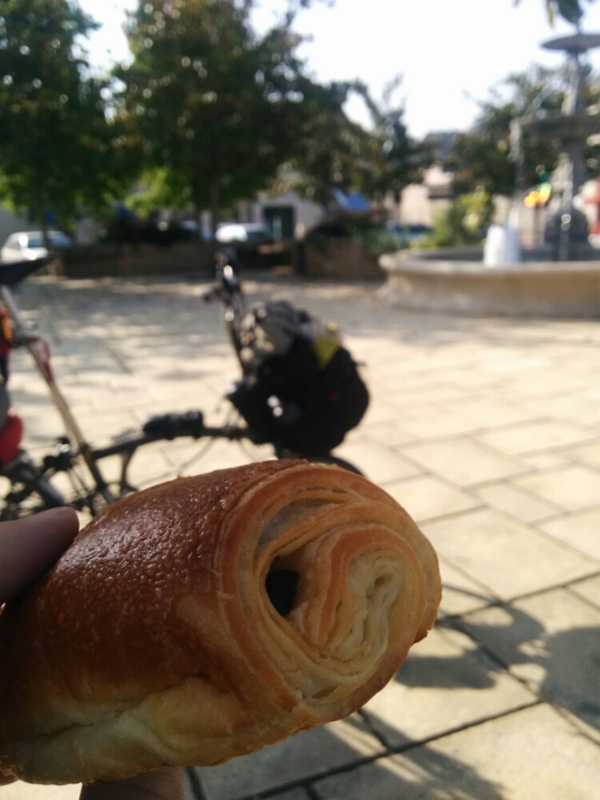 Breakfast at the hotel was pricey so I visited the boulangerie instead. Having checked the ferry times and because the camp sites around here appear to have shut up for the Winter, I’ve booked my ferry for Friday night crossing and will be making my way North instead of heading around the coast. 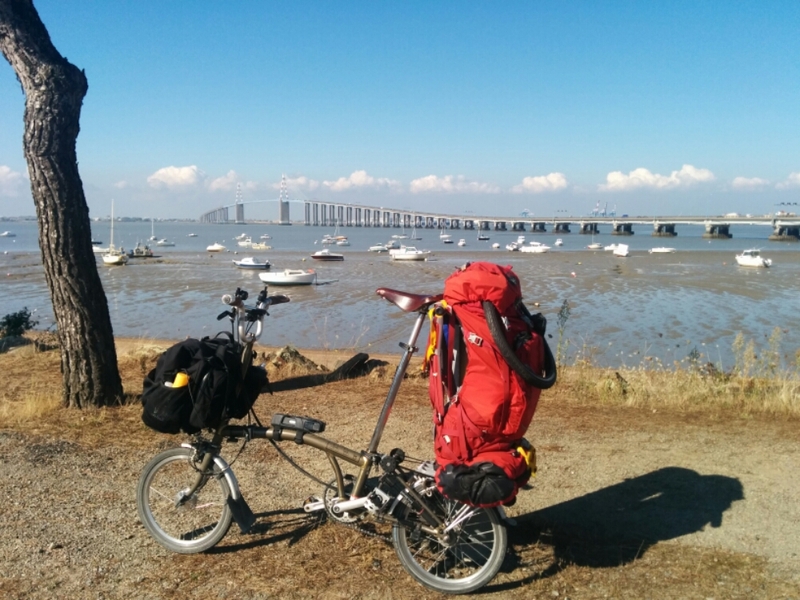 So today I cycled back to Saint-Nazaire and then up towards Rennes. 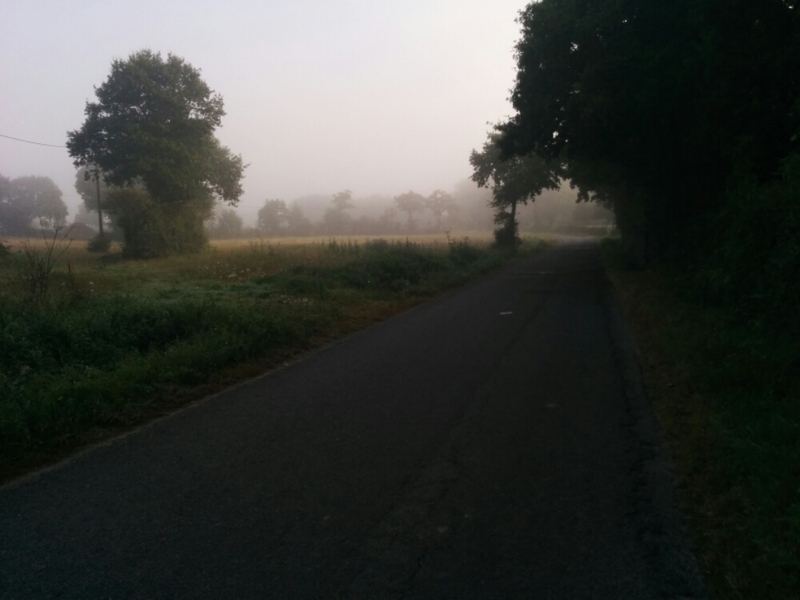 It was a foggy start, but it lifted by 10ish. In case you haven’t seen fog before.. 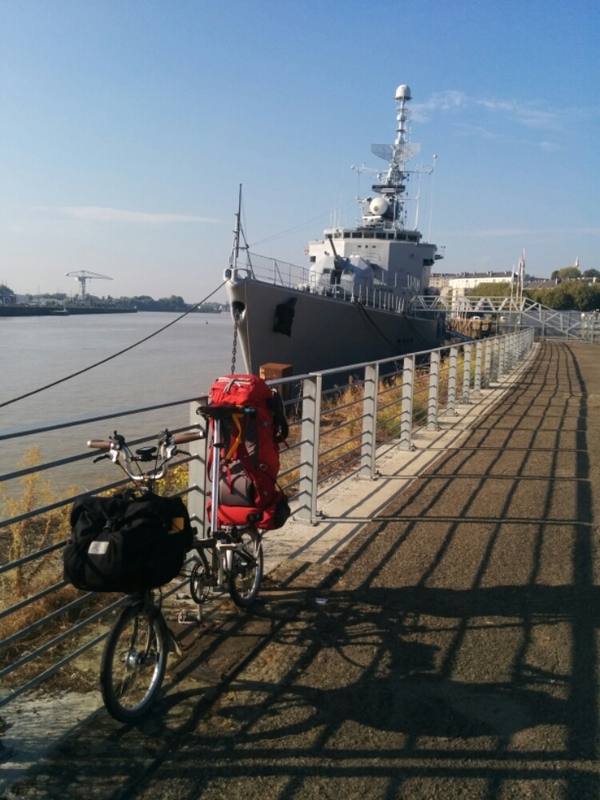 The first couple of hours cycling wasn’t too pleasant – rush hour in Saint-Nazaire, followed by cycling along busy roads with all the trucks from the industrial port areas. I also managed to pick a route that went by what looked like a Total oil refinery and storage facility, so oil tankers whizzing by every minute. I did go through a lot of villages that were well provisioned with small shops though, so had no problem stopping a couple of times for snacks. Not many pictures today though because it was mainly just a day of cycling along country roads. 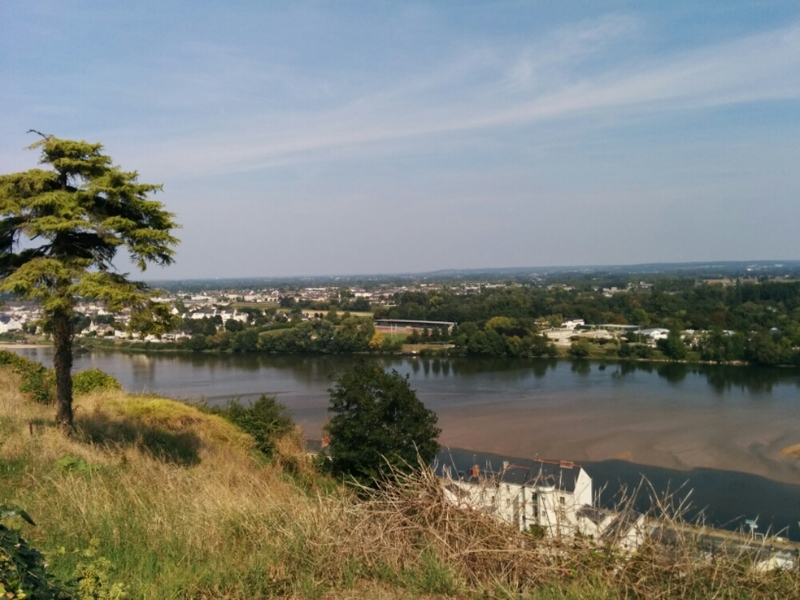 Also a few small hills, which brought the day’s total ascent to over a kilometre – the most climbing in a day of the trip. 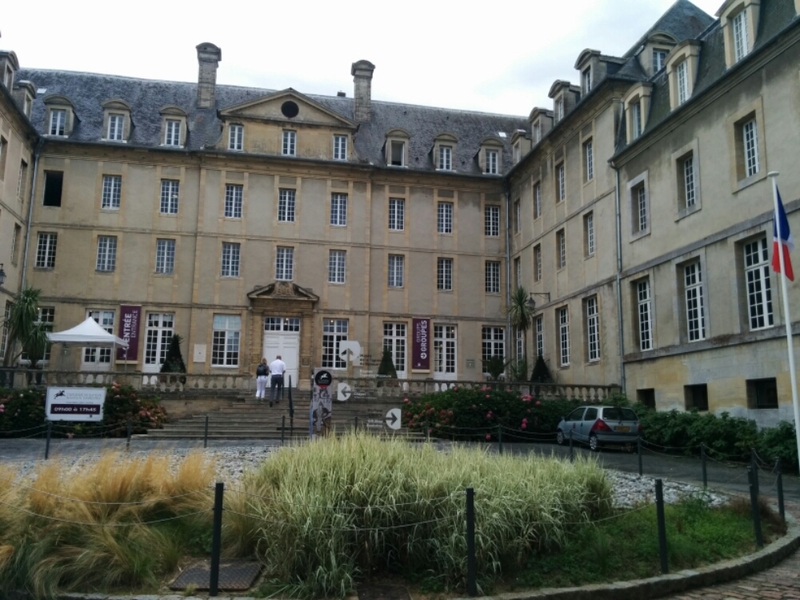 When I got towards Rennes I searched for a cheap hotel and all the really cheap ones are booked up. Maybe there’s some cheapskate convension on. 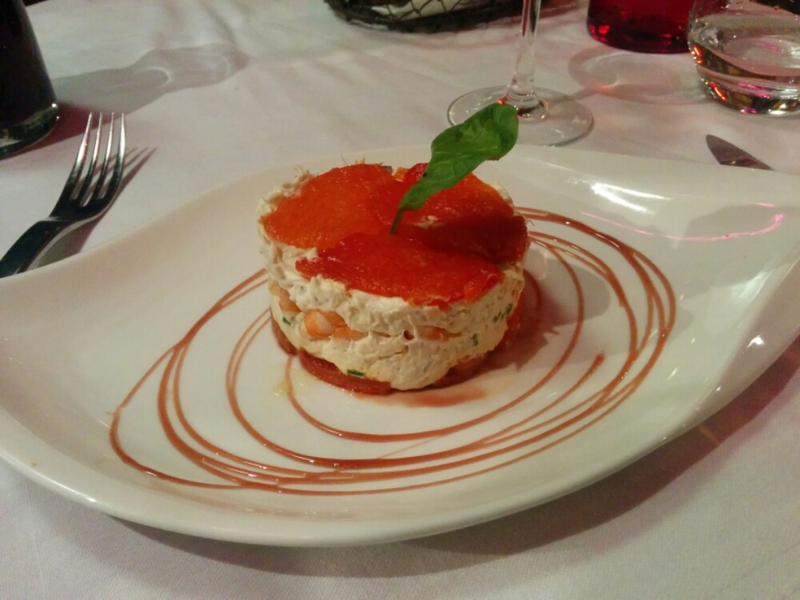 Anyhow, I found a room, checked in, then popped out and found an Indian restaurant not too far away. Tikka massala very different to that in UK. 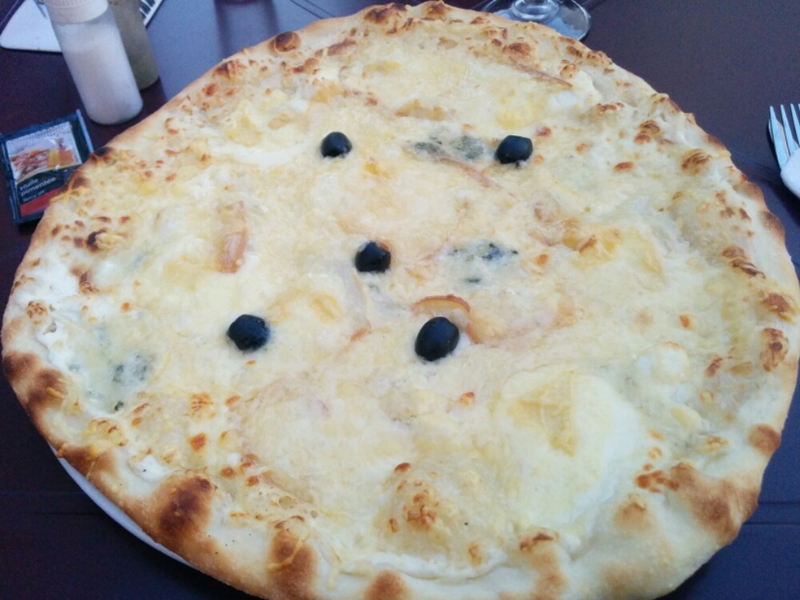 And to celebrate being in France I had a garlic nan bread. 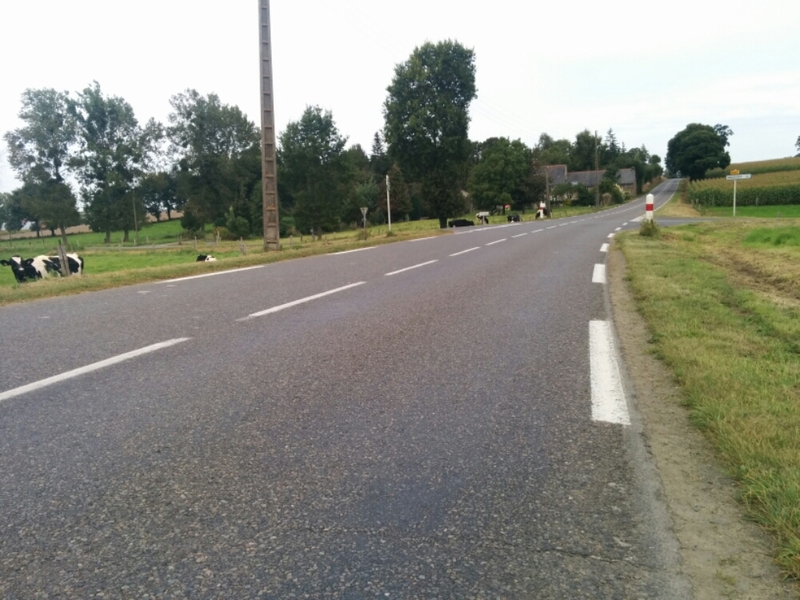 Pornichet to Rennes, 152 km. Total so far = 3,689 km. 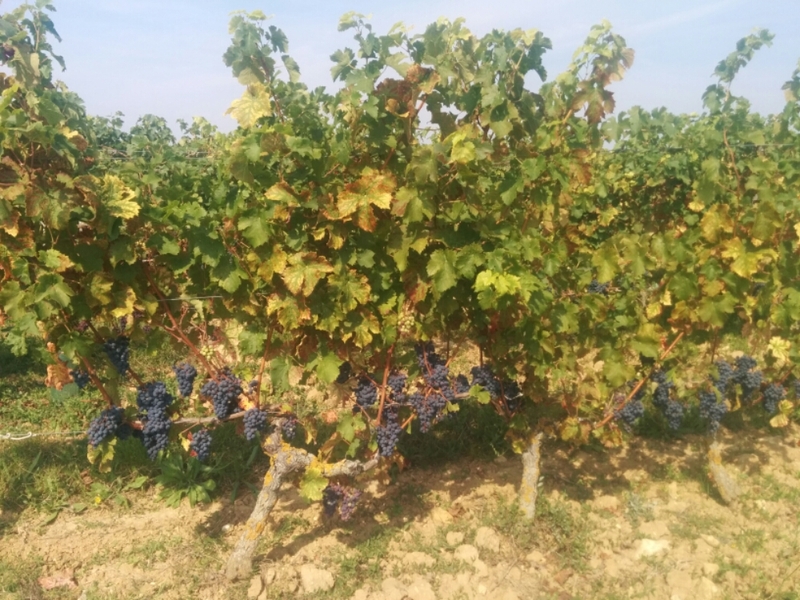 Day 38 : Loire valley? Tick. Awake to a comfy bed. The Brompton got a good night’s rest too. Hotel more than happy to have bikes in the rooms. 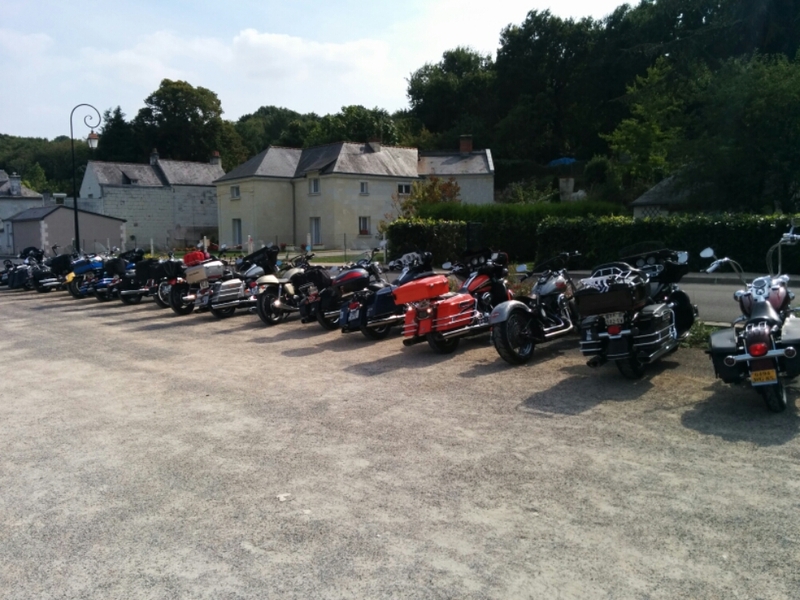 Breakfast at the hotel, then a quick ride around Nantes. Nice town! It looks like cyclists are well catered for too with segregated lanes in the city centre. 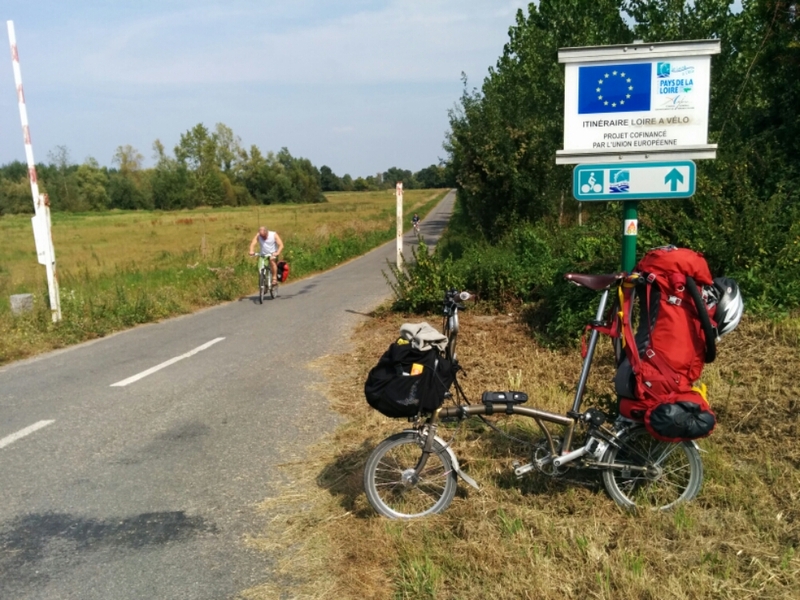 I found a few Eurovelo signs and did my best to follow them out of town. 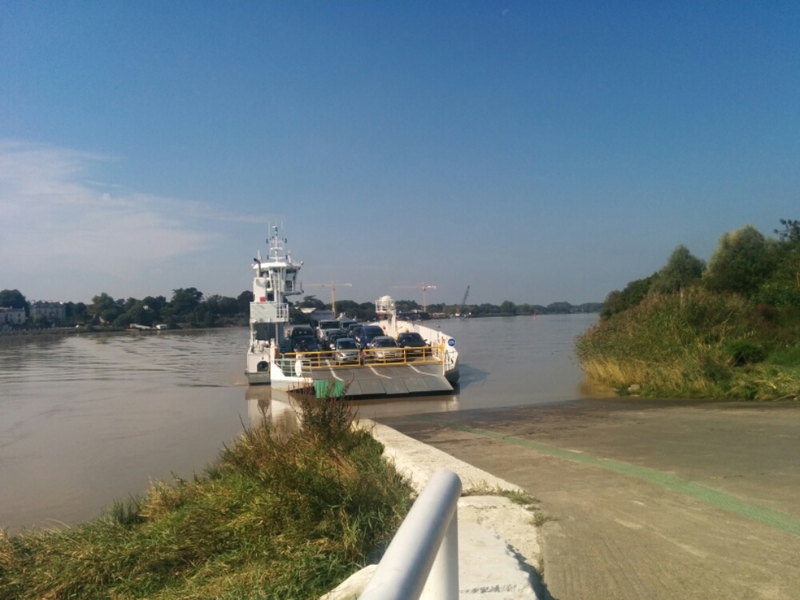 I had to catch this ferry over the river at one point. It was free, which was nice. I found a supermarket to buy some lunch from. 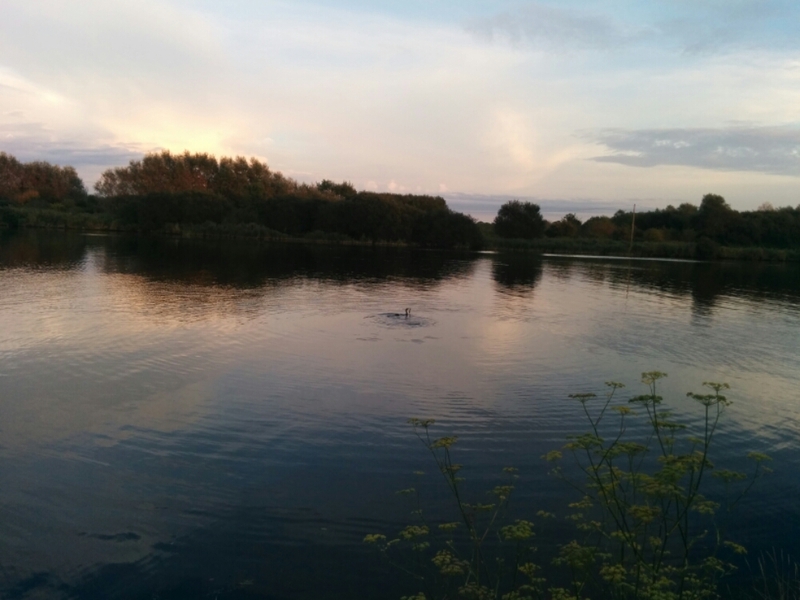 The route went past a lot of canal (which is popular with people fishing), before taking in some countryside. 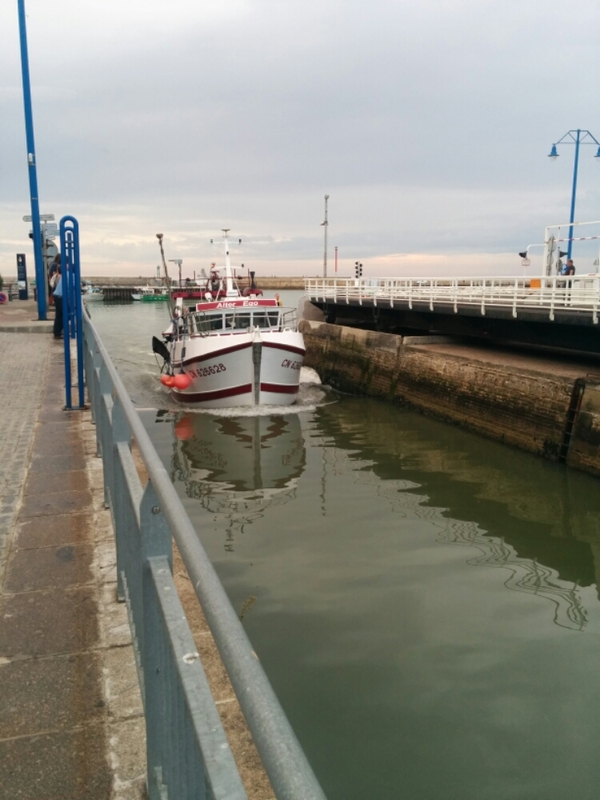 I eventually reached the Atlantic, completing my East to West crossing of France. It’s a busy bridge with lots of heavy traffic heading over, and the cycle lane is just 1.25 m wide and separated from the traffic just with a painted line. I took it easy, concentrated on the little patch of ground ahead of me and made it over in one piece. Not for the faint-hearted. I had a couple of camp sites on my route, but they’d both closed for the season, so I found a hotel room, had dinner in the hotel and got some reading done. 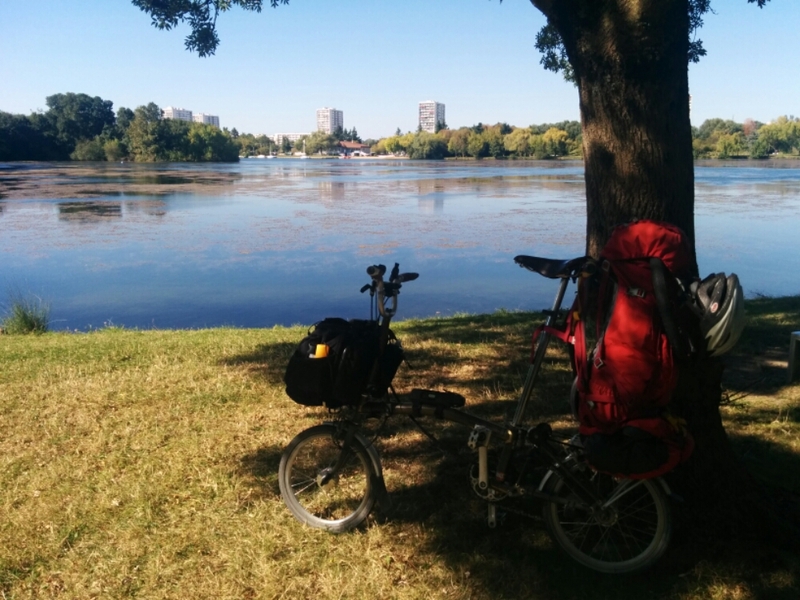 Nantes to Pornichet, 96 km. Total so far = 3,537 km. Awake to a tent free from condensation! Warm night, and pampas grass at the camp site kept things cosy. 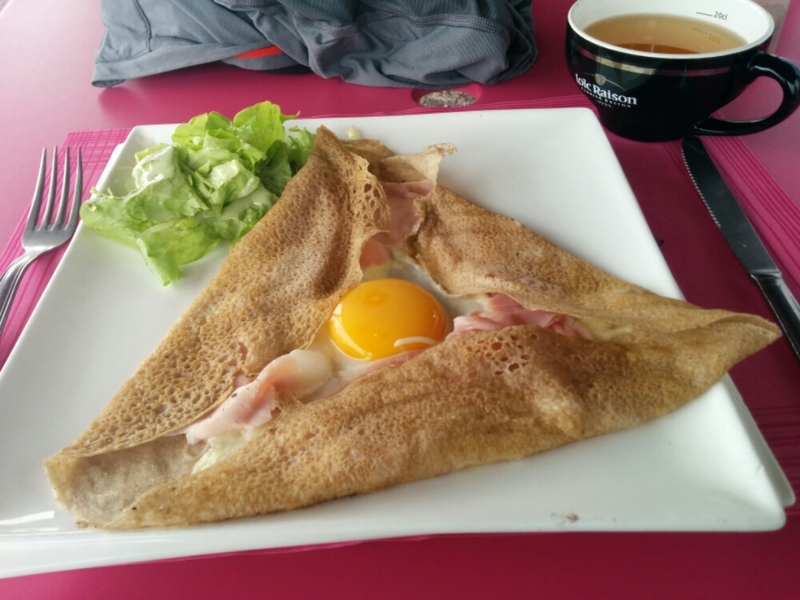 Started off, and found a café and boulangerie after 30 mins. 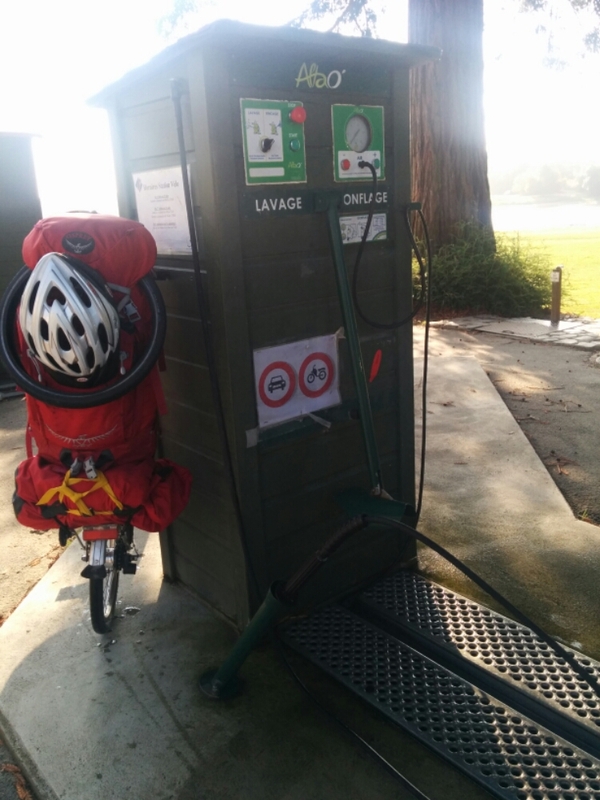 Then I came across this bike service station. Admittedly it’s Sunday and this place is crawling with VTT (vélo tour terrain) bikes, so it has a lot of customers, but it’s great. I was able to rinse off 3,000 km of dirt and pump up my tyres to 100 psi (well 6.5 bar anyhow). I’d like to see more of these! 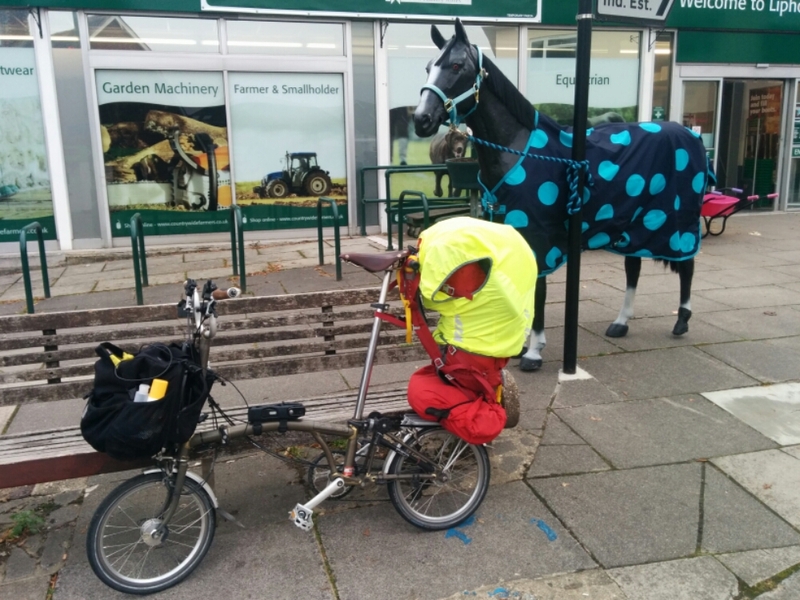 This one had a wheel clamp that couldn’t manage holding the small Brompton wheel, but otherwise, fantastic! 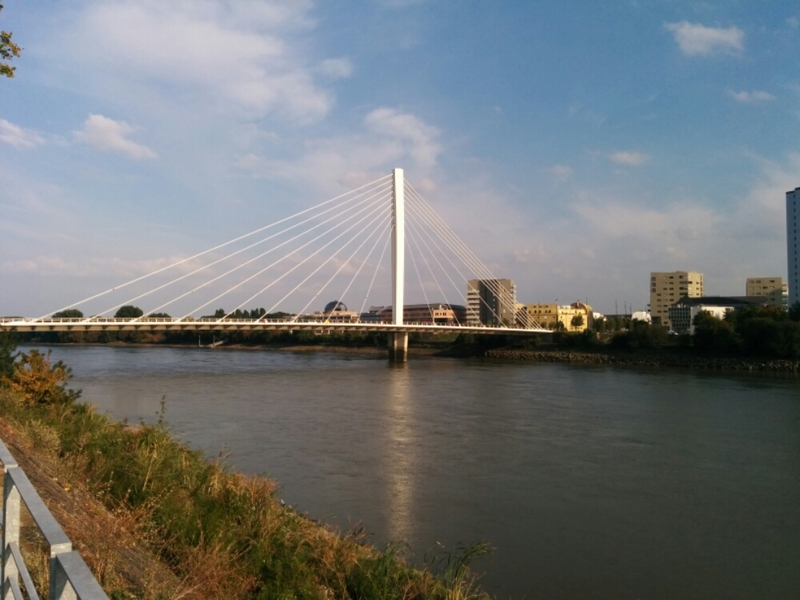 I rode along a narrow track between river and lake for 5 km. This track was filled with Sunday walkers, joggers, runners and cyclists. I’d been travelling down it for about 20 mins and decided to switch on my phone to see how it compared with EV6 only to discover I’d been travelling up a spur of EV6 to Angers. I double checked and realised I had to back track to get back to where I wanted. Gah. Then after an hour I noticed the back end sluggish. I checked and saw the tyre was mostly deflated. I had been expecting this. Over the past 3,000 km I’ve ridden over all sorts as I’m sure you can imagine. 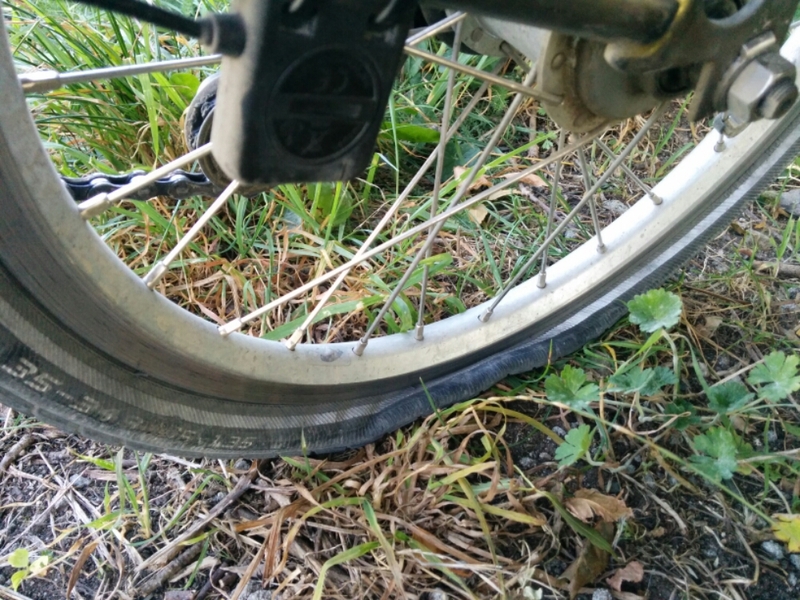 I’ve ridden 100s of km alone where I’ve thought, “This will puncture my tyre, how did that not puncture my tyre?”. I find it amazing and a testament to Schwalbe Marathon Plus tyres that I’d got this far without a puncture. 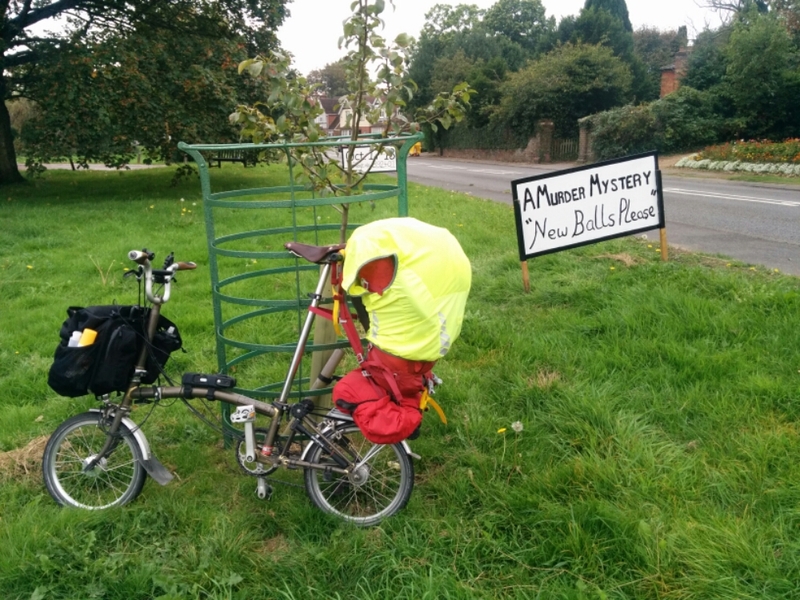 Anyhow, I am well versed in the art of Brompton rear wheel puncture repair, and I had come prepared (with 5 fresh inner tubes). For those not in the know, there are no ‘quick release’ elements involved with a rear puncture repair on a Brompton. It’s even more involved when you need to remove your touring luggage! 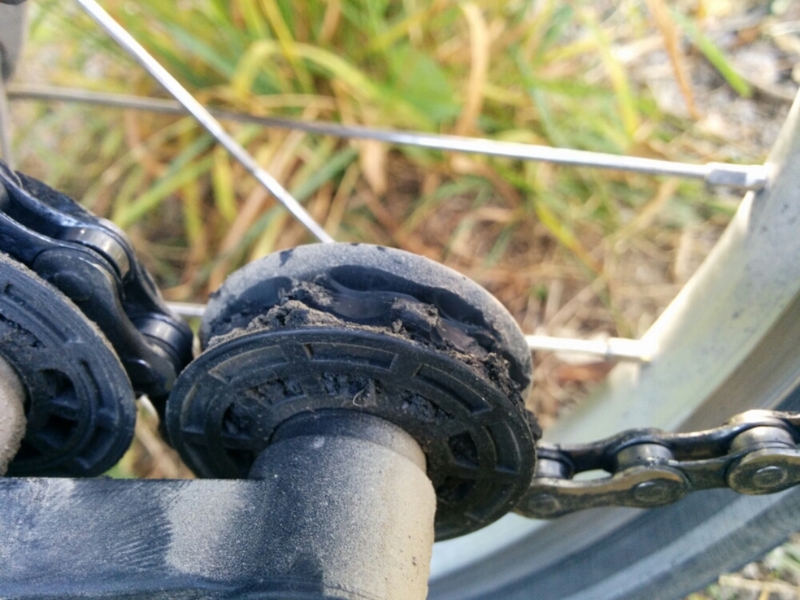 I’m glad I’d found the bike wash earlier, but also noticed the chain tensioner cogs have next to no teeth left. All the cycling in bad weather with no cleaning has taken its toll. After repairing the puncture and getting on my way, it wasn’t long before I saw these cows standing in the middle of the river, which cheered me up..! Those black dots in the river are cows.. I decided to skip on lunch. I wanted to make it to Nantes today. I passed a few good lunch options, but they all looked like it would take at least an hour (as lunch should!) so I kept on pedalling. At around 5 I had an orange and a can of coke which I’d been saving in my bag for just such an emergency. 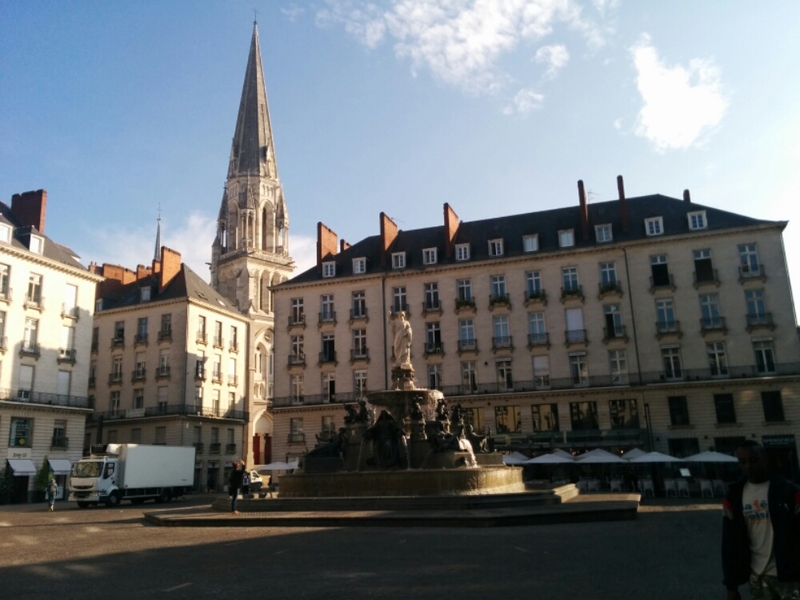 I saw a camp site 30 mins ahead of Nantes, but with no shops visible nearby I didn’t want to risk a night with no dinner, so I cycled on to the centre of Nantes then found a discounted hotel room to check into. 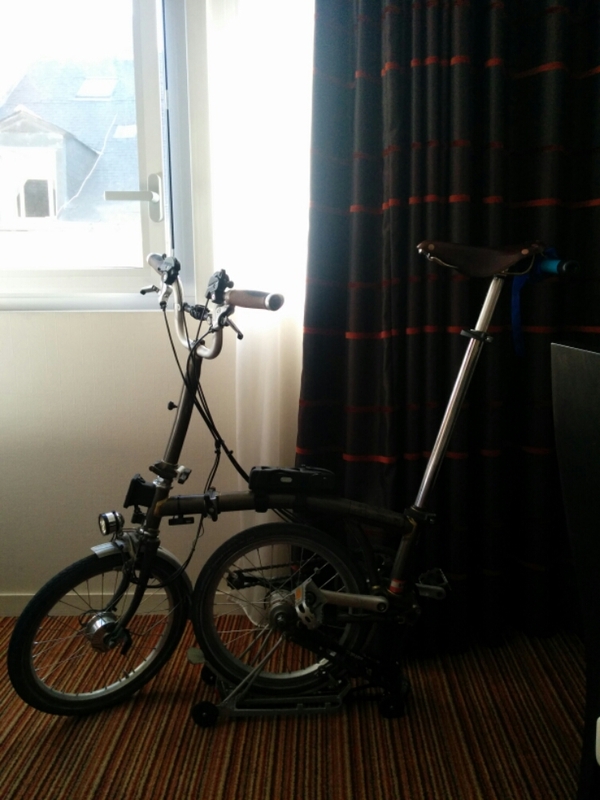 My hotel is very nice, they even gave me a whole separate room to check the bike into! Took a shower then took a walk around town. It’s very nice and full of life. Another city that gets my stamp of approval 🙂 If you’re paying attention, that’s Münster, Landshut, München, Besançon and Nantes. 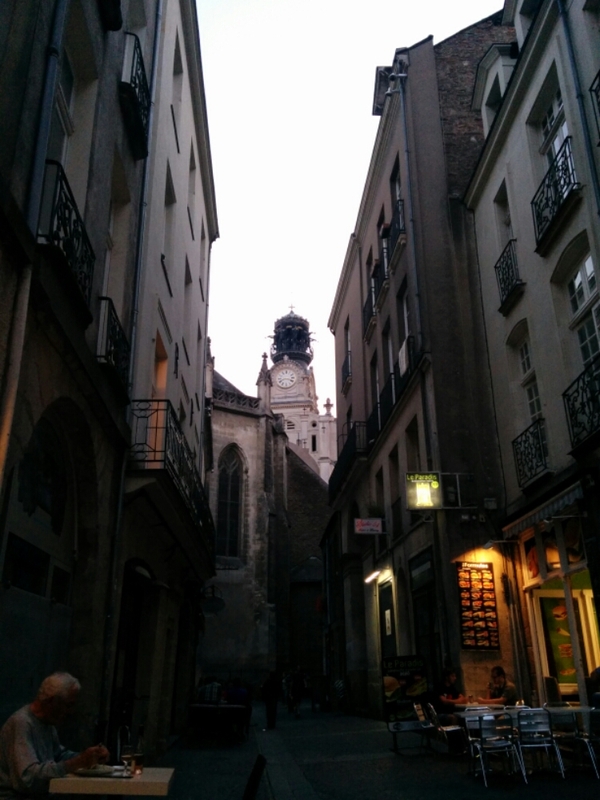 That’s a church in the centre of Nantes. 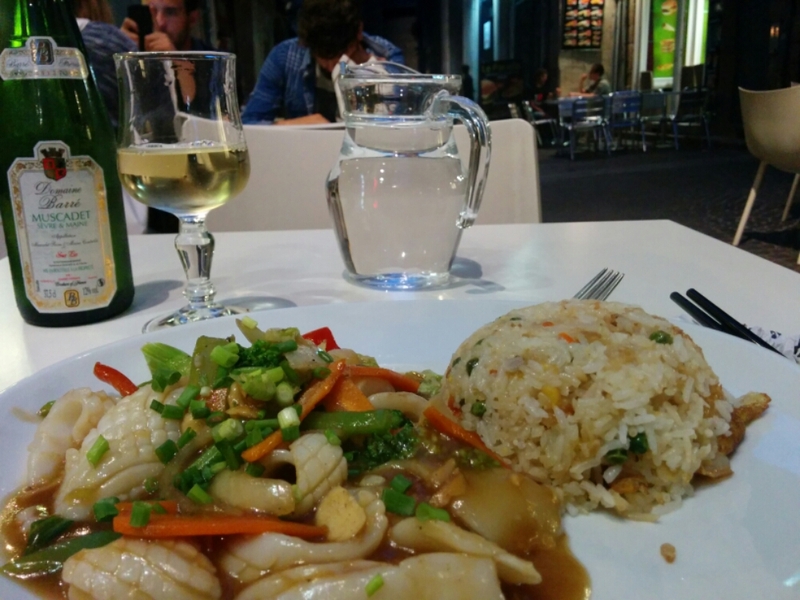 In the street was a guy playing accordian..
Dinner was Vietnamese. 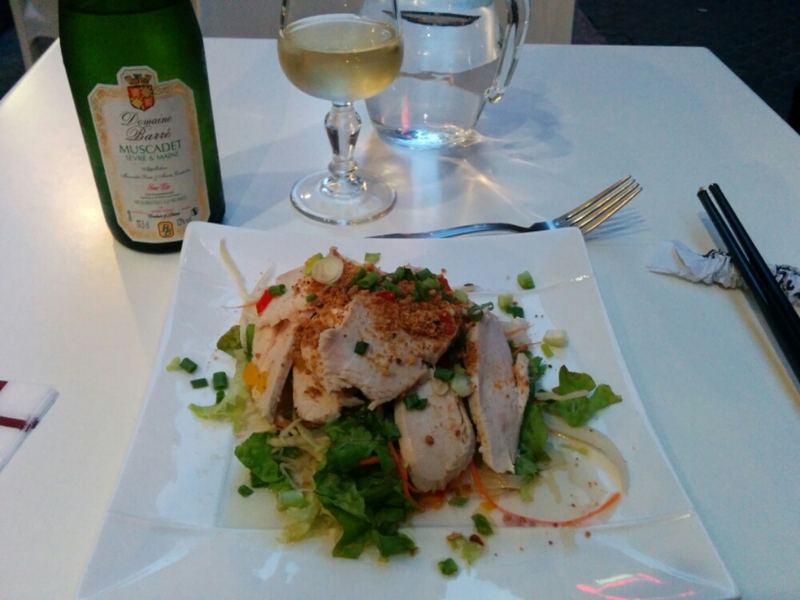 With a half bottle of the local wine, Muscadet. After that I found an Irish pub where I could practice my English. 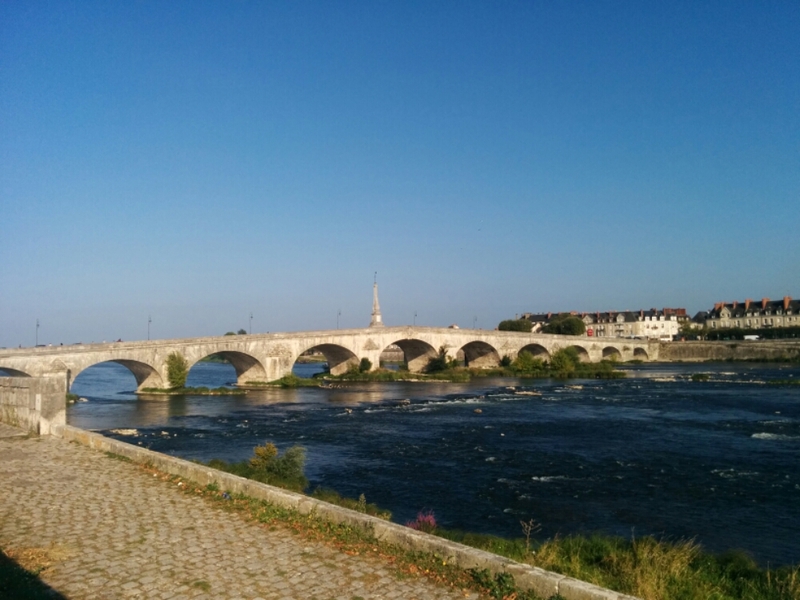 Angers to Nantes, 120 km. Total so far = 3,441 km. Clear night so outer tent soaked with condensation in the morning. Packed up wet tent, left the camp site.. Stop me if you’ve heard this one before.. 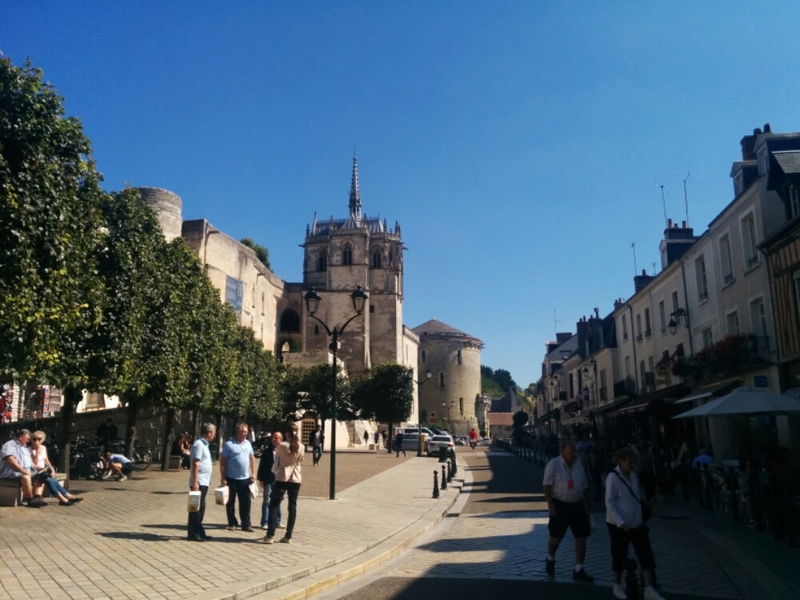 Headed into the centre of the town and found a café for a coffee and and a boulangerie for some pain au chocolat to have later. Rejoined the cycle route, for some more very pleasant cycling on a sunny day. Flat roads, mostly decent surface, though a half km stretch of unforgiving large cobbles that someone sneaked in. Then things got a little hillier as I headed towards Saumer. Found an appropriate place en route to get lunch. 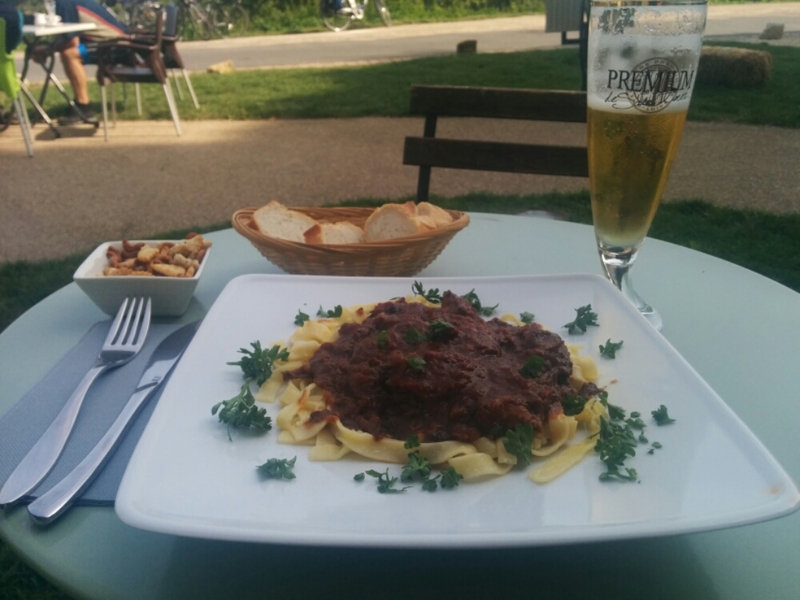 A kind of beef casserole with pasta. Good cycling fuel.. 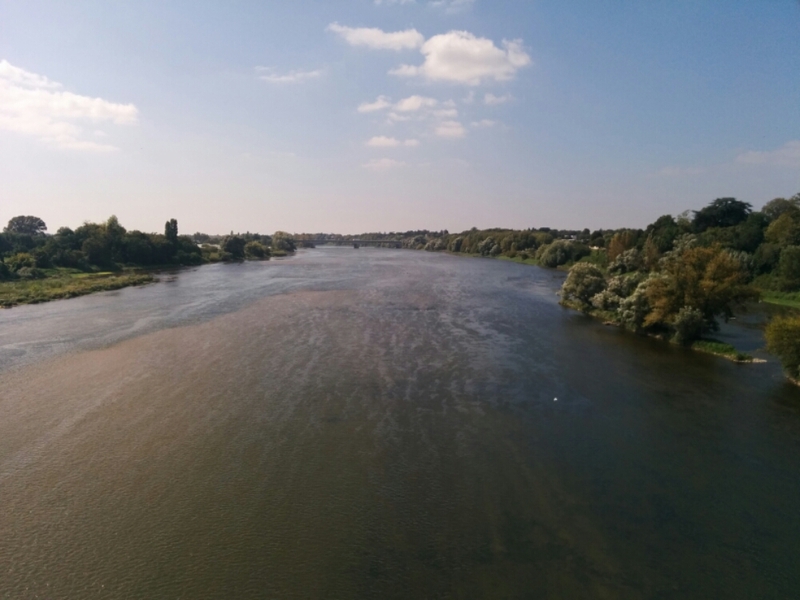 The Loire is wide, slow and shallow. I wonder how it changes in Spring time. 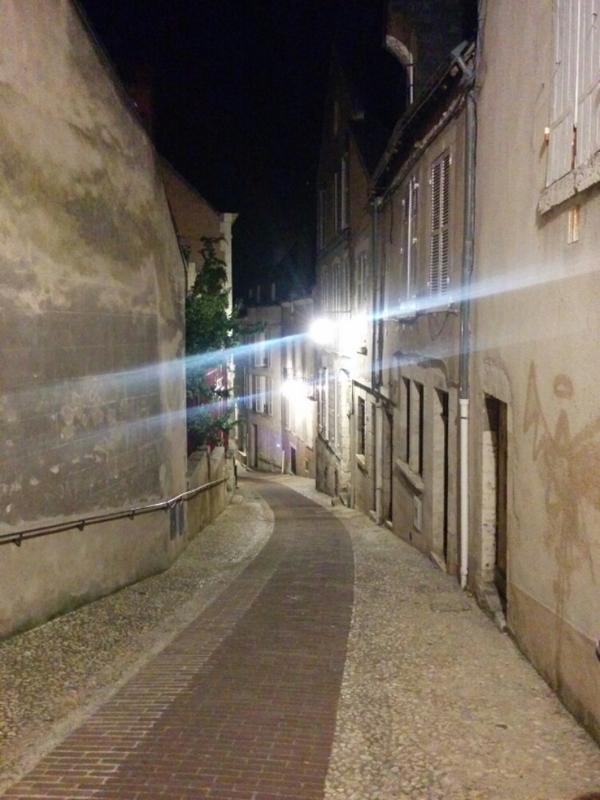 When I last visited Saumer over 5 years ago the town was a lot quieter. This time it was really bustling. Looks like they’re doing a bit of decorating on the chateau at the moment. 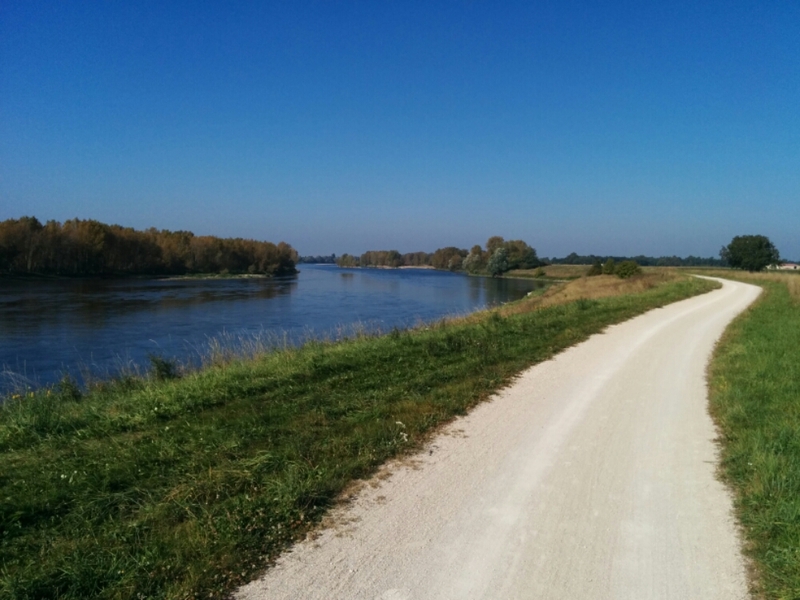 The stretch along the Loire to the West of Saumer is interesting. Lots of nice villages. My navigation is entirely reliant upon looking for the little green and blue logo on the bottom sign of this picture, which I’ve been following for over a week now. 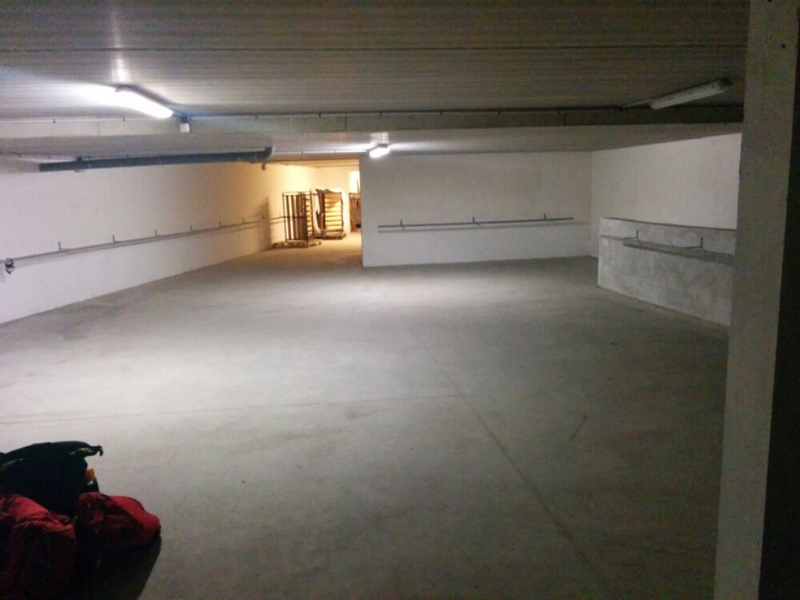 Some bikers were visiting a cave of the non-wine variety. All Harleys except one Triumph. 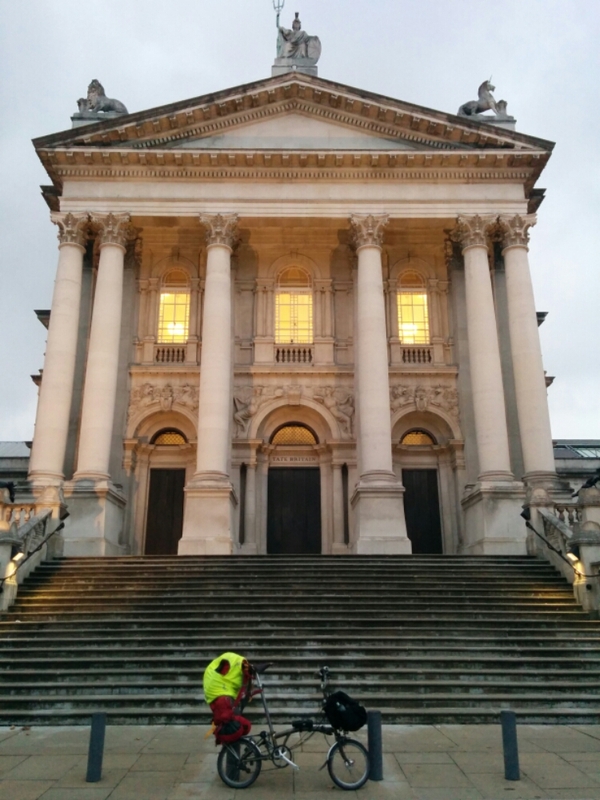 I’d have leaned my bike against the end one for a photoshoot, but feared a Pee-wees Big Adventure scenario.. 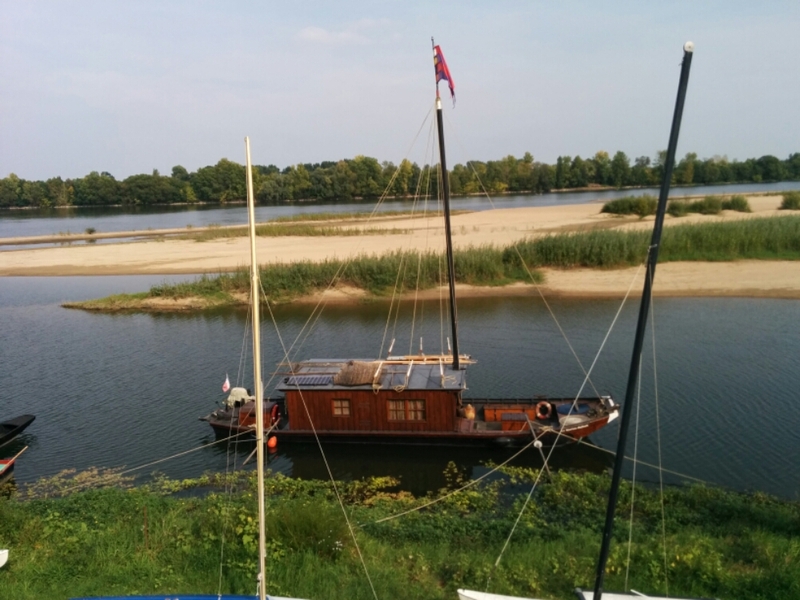 There are some interesting boats here with foldable masts and presumably retractable keels to navigate the shallow waters. 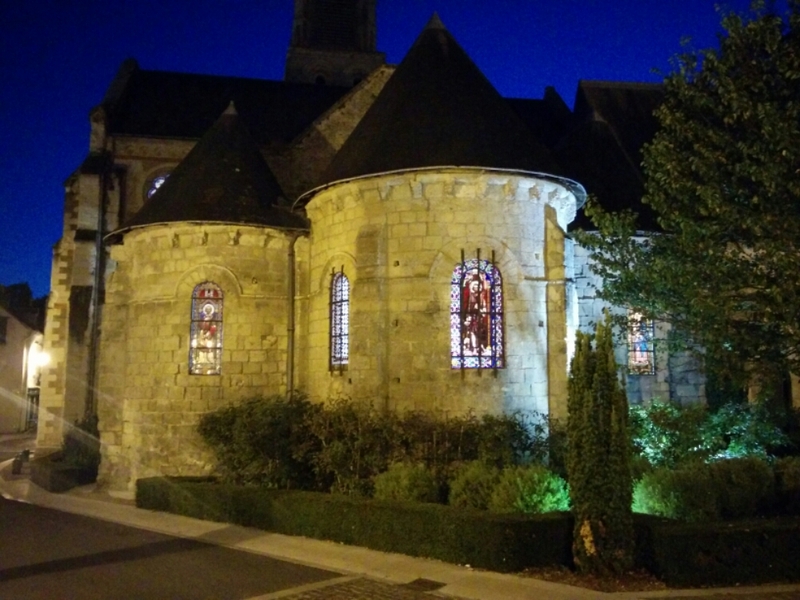 I found a campsite near Angers. It has the hole in the ground toilets! But also some toilet seat less ones too, so spoilt for choice really. The high street near the campsite had the option of a 7-11, a pizza place, and a pizza and burger place. I got a half bottle of wine from the 7-11 and a takeaway pizza to have at a bench at the camp site. Happy with that! 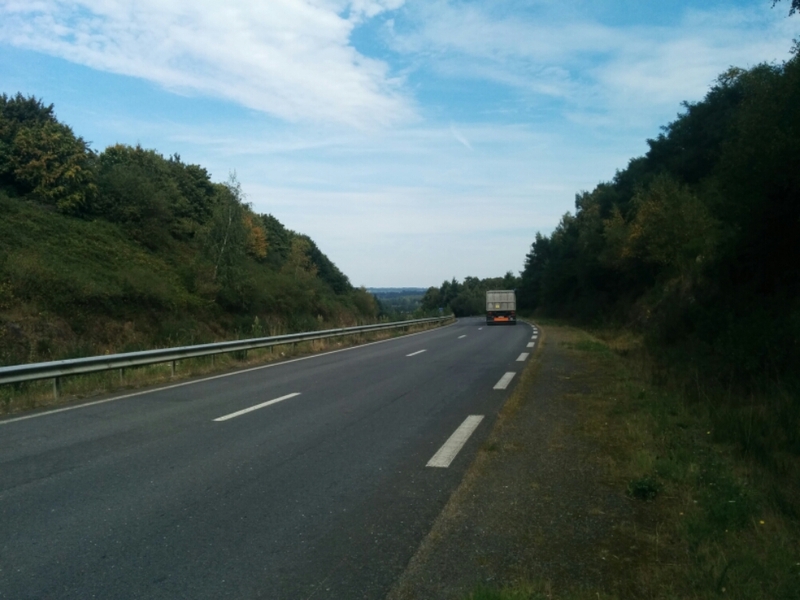 Langeais to Angers, 112 km. Total so far = 3,321 km. Breakfast was a croissant and a coffee at the hotel, then back on the road. Another easy day’s cycling, the majority of it on traffic free roads. 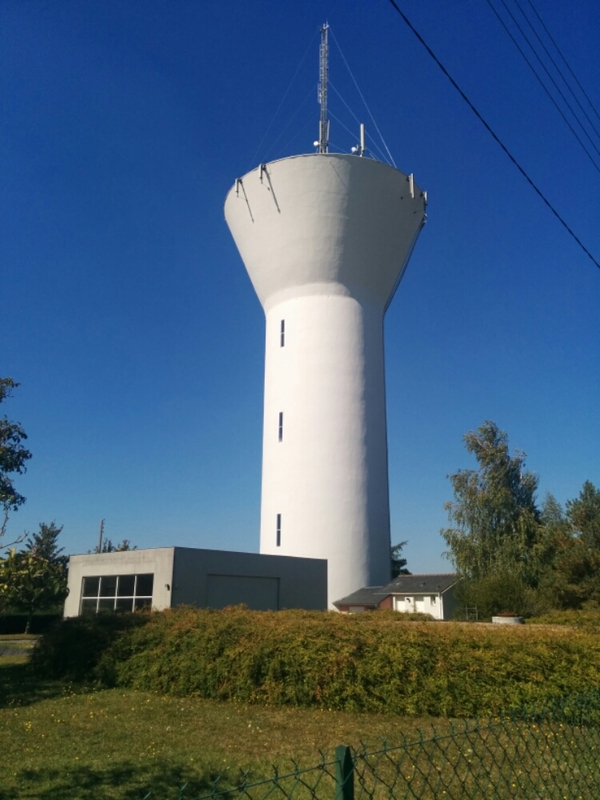 There are a lot of these water towers about. I quite like them. 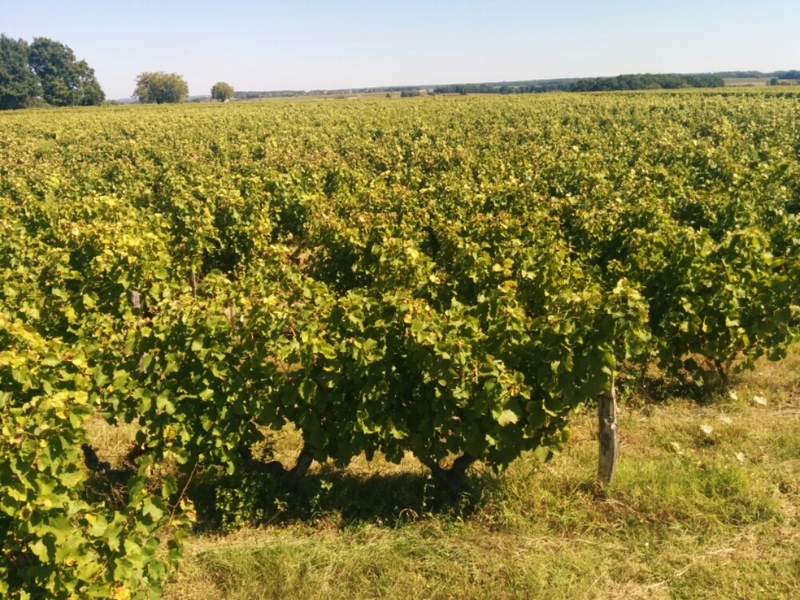 Lots more cycling by the Loire..
Lots more vineyards. Also seeing a lot of sunflower fields, but they’re passed their prime now and look a little sad. Tours is a big town. Not too photogenic. I picked up a sandwich whilst there. 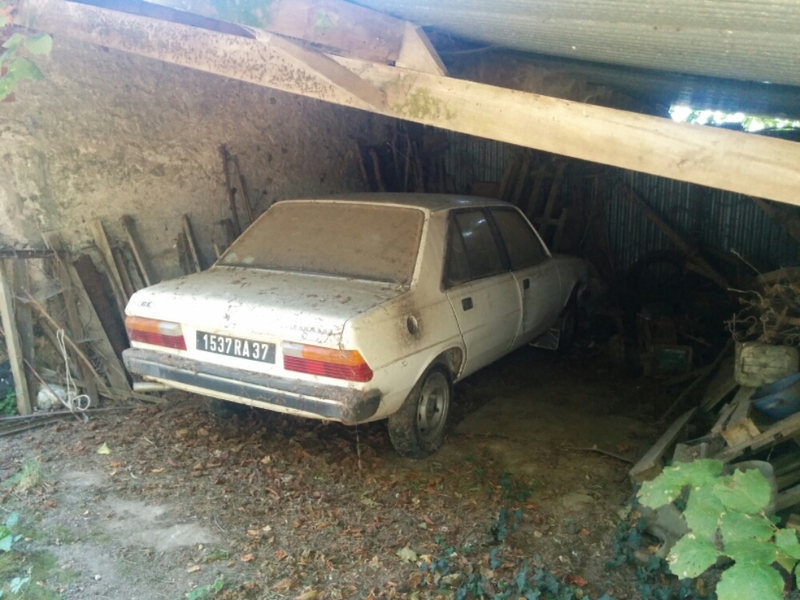 Another French car for the collection. 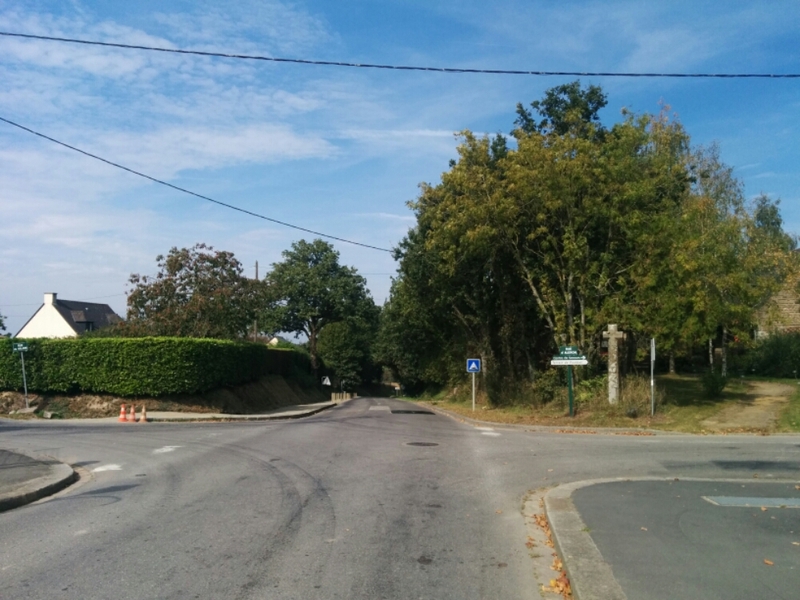 My first choice of campsite was closed, so I went to the municipal campsite in Langeais instead. After pitching the tent I cycled into town and found a pizza restaurant open. They had the normal 4 cheese pizza on the menu, but also a 6 cheese one, so I had to try that. Needless to say I didn’t want to see the cheese board after that. The olives make it healthy, right? Then back to the campsite to bed. 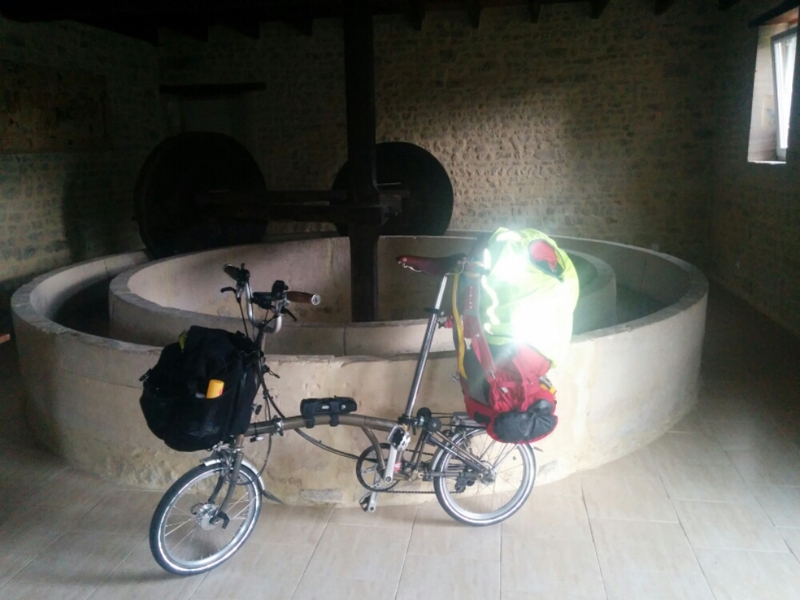 Blois to Langeais, 110 km. Total so far = 3,209 km. A cold night so not much sleep. 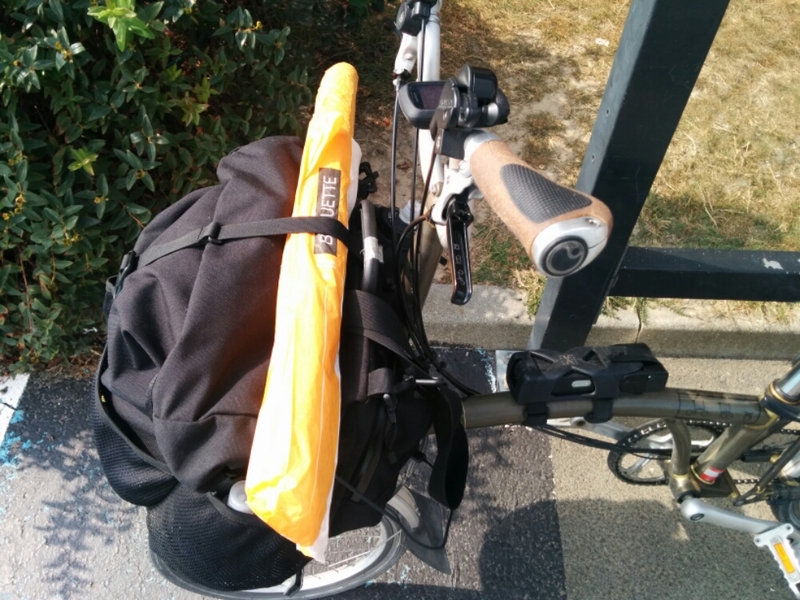 After packing up I headed back a kilometre into the town centre to visit a café to defrost with a coffee, and then visit a boulangerie to get a couple of pain au chocolats for later. 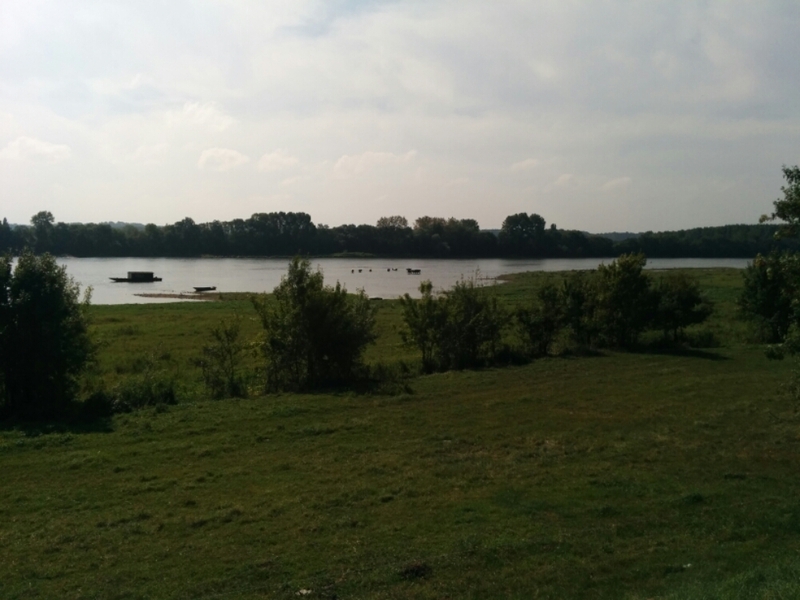 When I went back to get on the route I took a wrong turn at a part that wasn’t that clearly signposted and proceeded to waste about half an hour on some pretty rough ground, taking the bike through an outdoor fitness course and then a nature reserve. Not the best start! Once I had backtracked to the start and got going again it wasn’t too long before the sun came out to warm things up. 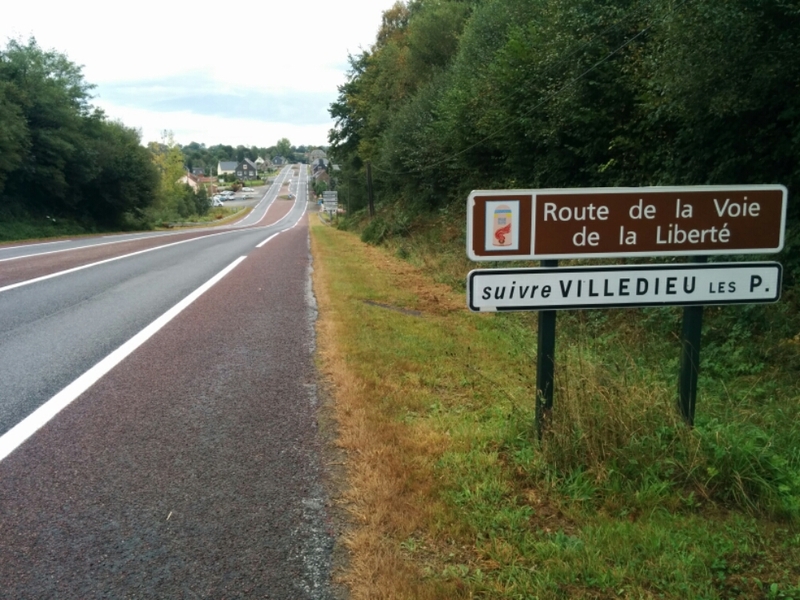 I managed to have a conversation entirely in French with another cyclist whilst cycling along at one point, which was a nice milestone. 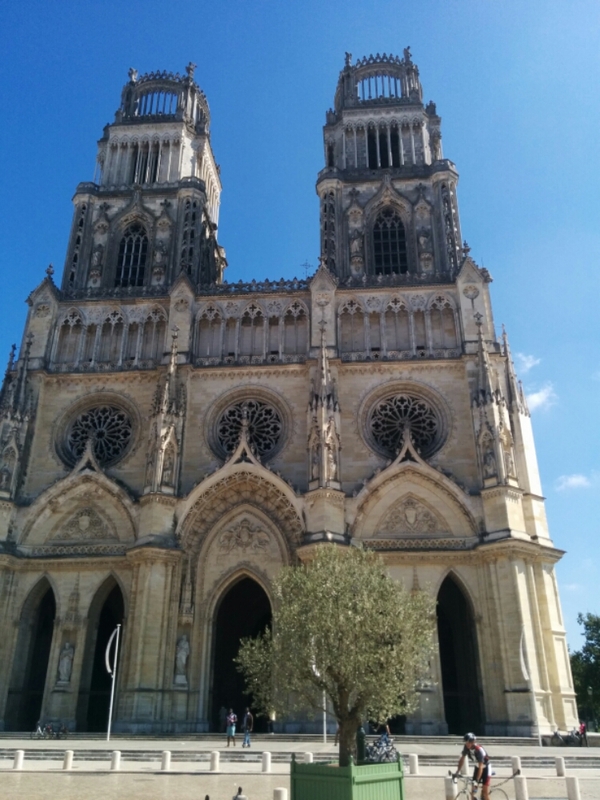 I made it to Orléans in time for lunch. Orléans reminded me of a mini Paris. 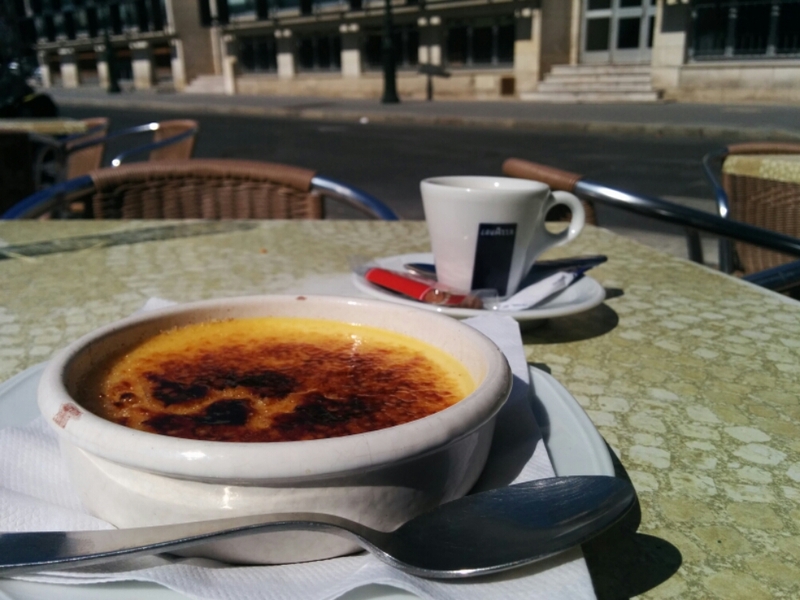 I had the plat du jour and a crème brûlée. 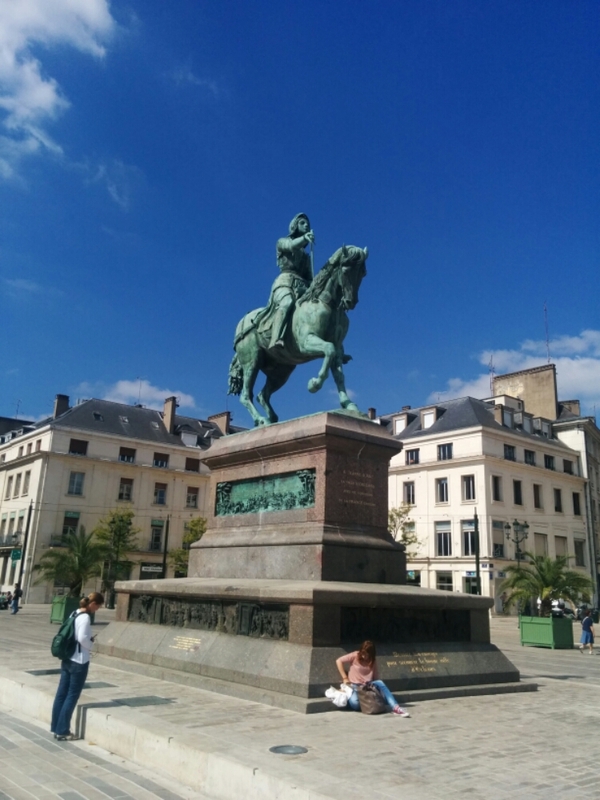 Here’s a statue in honour of Joan of Arc who came here almost 600 years ago. 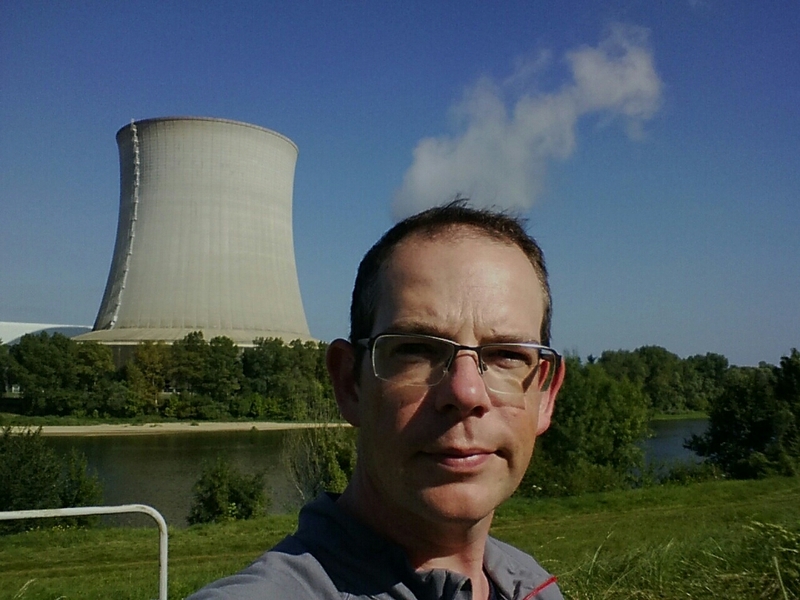 I cycled past the Saint Laurent nuclear power plant, which is the third I’ve encountered along the Loire – one more to go I think. Wondering how clouds are made..
Whilst taking a break and the above photograph, a club ride of about 25 cyclists in club jerseys went by. When I got going again after a couple of minutes I noticed I could still see them in the distance, so I upped my pace and after 10 mins I managed to catch up with them, and was able to hang on at the back of the pack. 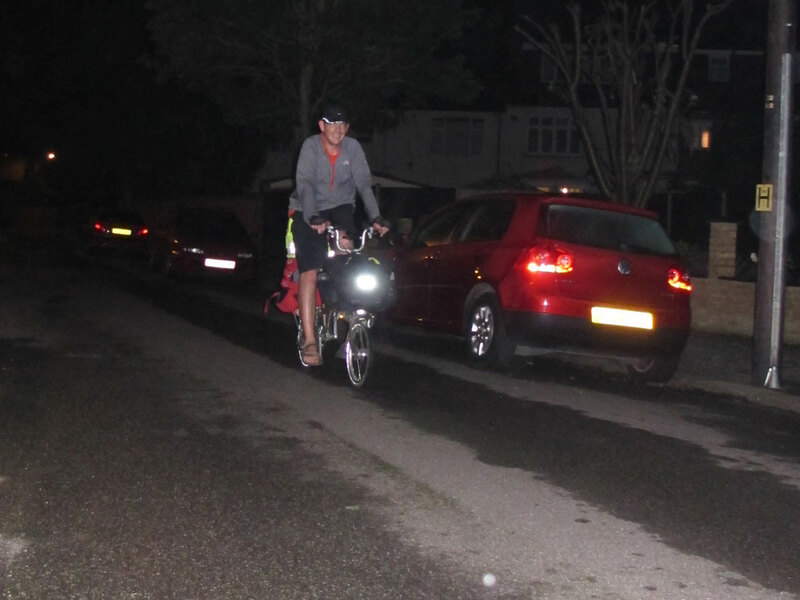 We were on a stretch of road that was shared use, and I noticed a couple of cars were approaching from behind, so I shouted ‘car behind’, as I believe one is supposed to do in these situations. 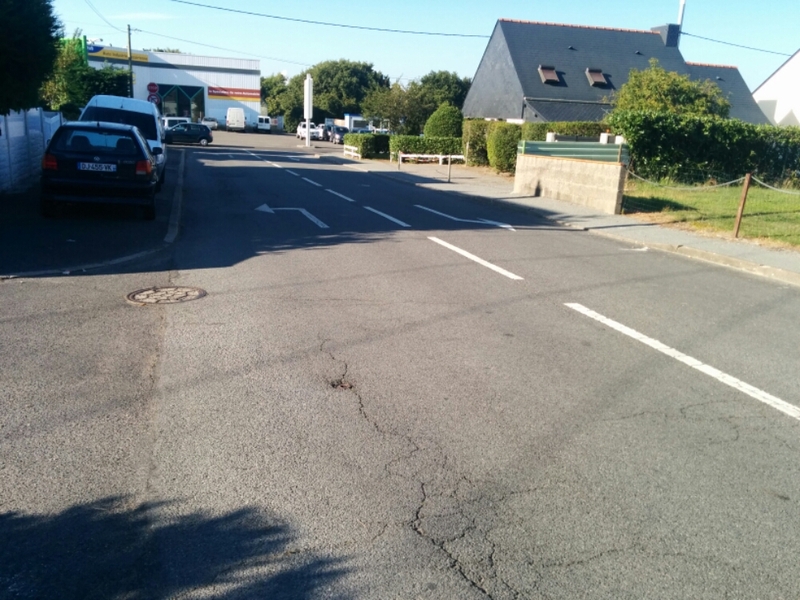 Someone looked and translated this into the French equivalent and the riders moved to the right of the road to make way for the cars. Once the cars has gone past I saw this as my opportunity to overtake the lot. At a distance behind the cars, bit in the gap they had left, I made my way to the front pf the pack and beyond 🙂 There were a few surprised looks and a few cheers. The road was smooth and I kept on at around 35kmh until I was out of sight then eased off a bit. In retrospect I should have asked the guy at the front if I could join the club. Next time! 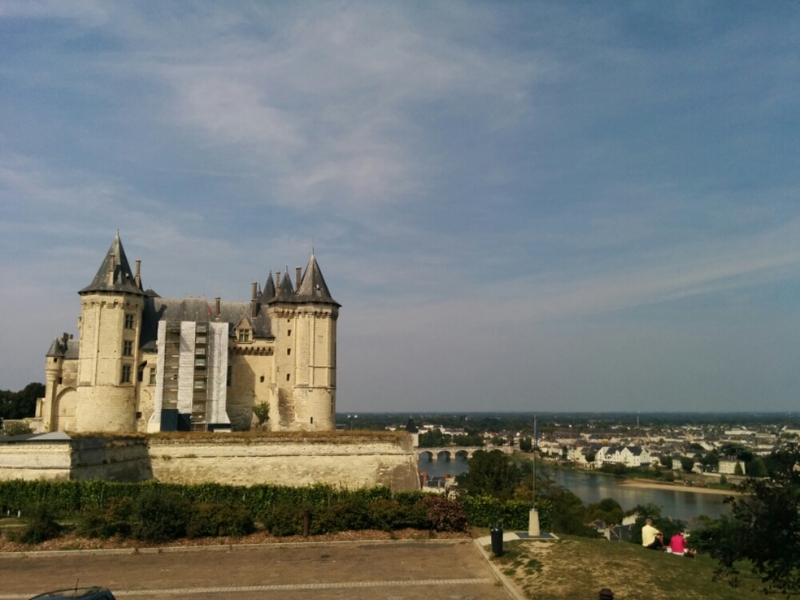 My port for the night is Blois. 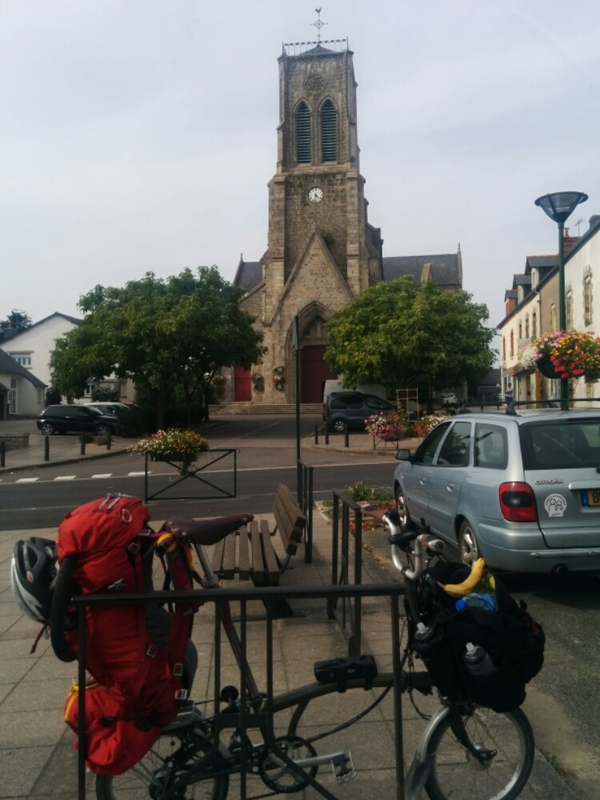 It looked like an interesting town to walk around, so I found a cheap hotel to check into, drop off the bike and freshen up, then popped into town for dinner and a walk. There are dozens of interesting streets with intestesting buildings. 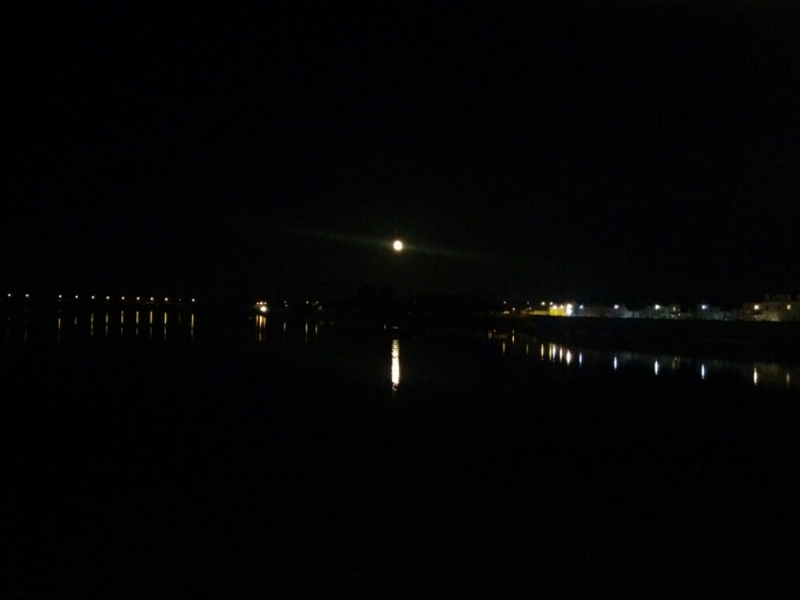 And then back to the hotel as the moon is coming up over the Loire. 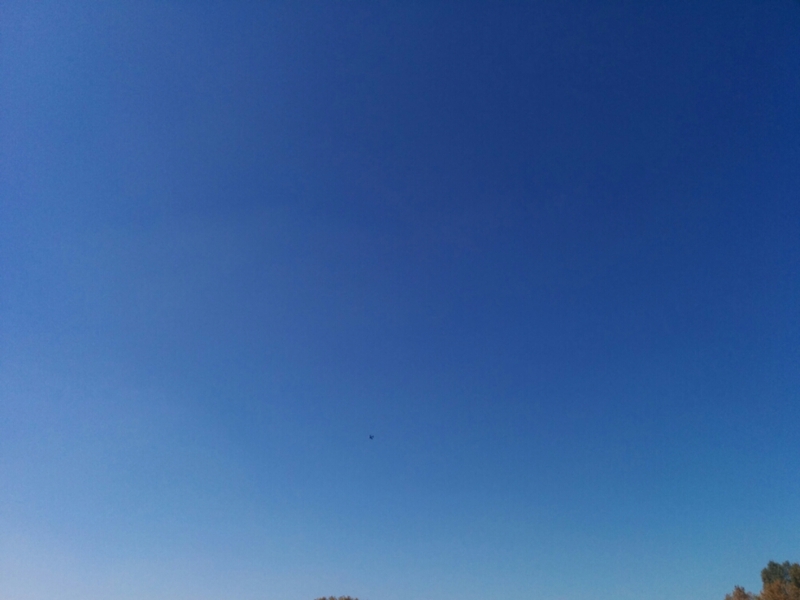 The white blob is the moon..
Sully-sur-Loire to Blois, 128 km. Total so far = 3,099 km.